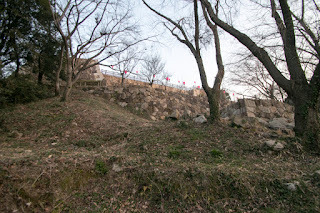 Kamei castle (亀居城) is located at Shiroyama hill of 80 meter height from hillside in the center of Otake city which exists in the southwestern part of Hiroshima prefecture. 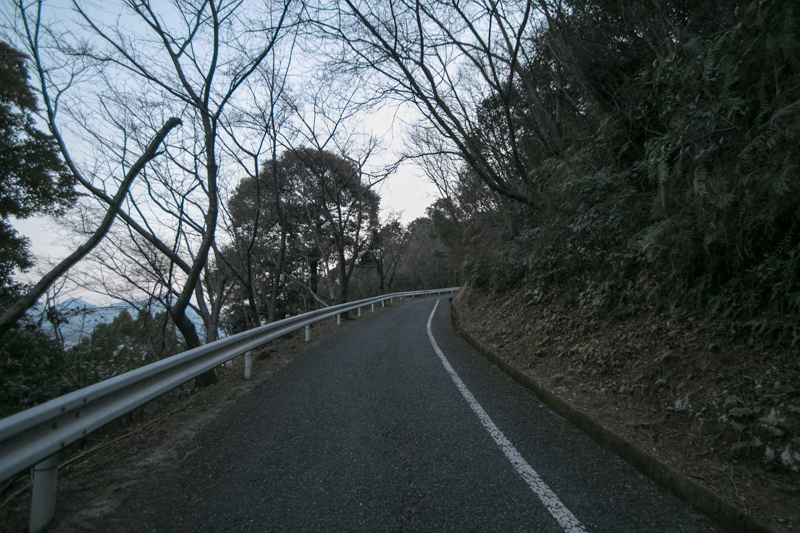 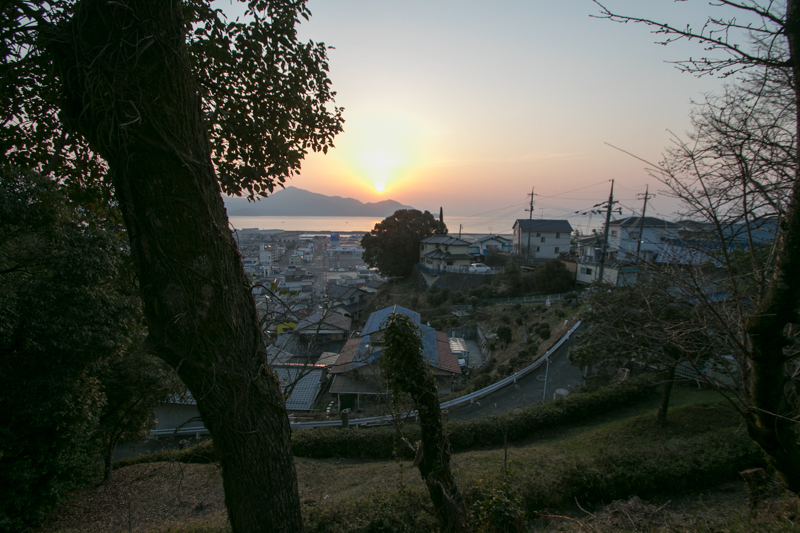 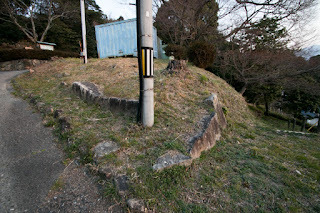 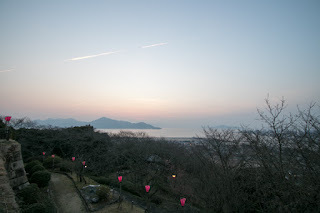 Otake area is a narrow flat terrace spreads along with the coast of Hiroshima bay, and it is an important area of communication where important roads, highway and trains passes even now. 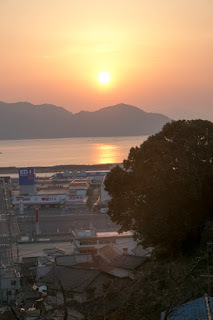 This city is also just four kilometer apart across the mountainous way from Iwakuni city which is the eastern border of current Yamaguchi prefecture. 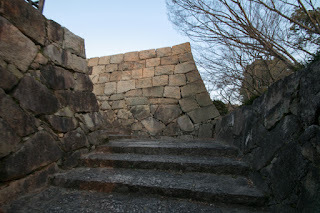 Kamei castle was newly built by Masanori Fukushima (1561-1624) who became the lord of Aki province and Bingo province (Hiroshima prefecture) from 1603 to 1608, after the battle of Sekigahara occurred in 1600. 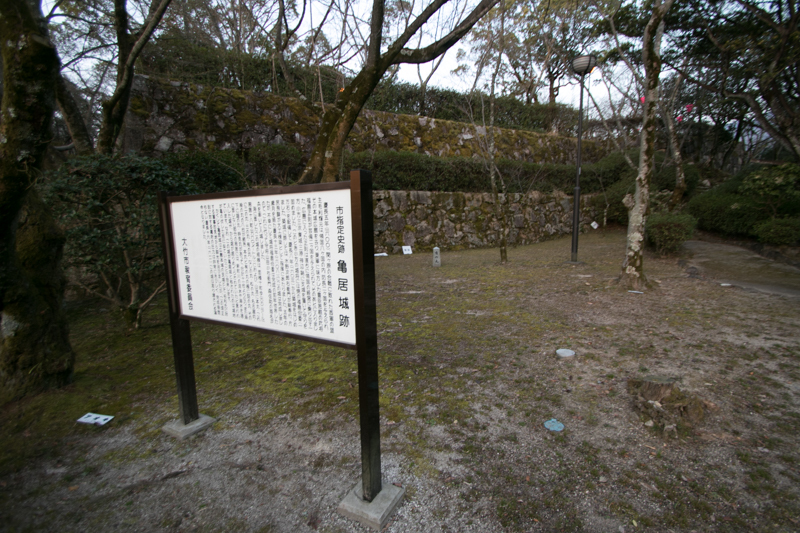 Masanori was originally a distant relative of Hideyoshi Toyotomi (1537-1598) who united whole Japan in 1590. 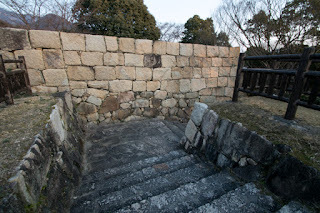 Hideyoshi was born as a son of poor pheasant and did not have many relatives and hereditary retainers, Hideyoshi called Masanori and brought up under him along with another relative Kiyomasa Kato (1562-1611), as future core of Toyotomi army. After grown up, Masanori and Kiyomasa became the regimental commanders of Toyotomi army, and activated in the battle of Shizugatake against Katsuie Shibata (1521-1583) occurred in 1583. 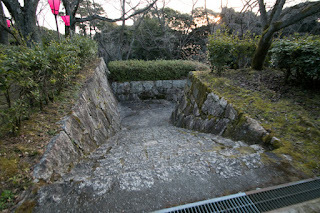 Different from other relatives of Hideyoshi, Masanori and Kiyomasa had a talent of commander and could lead large army. Thus Hideyoshi placed them as important point of communication or critical area. 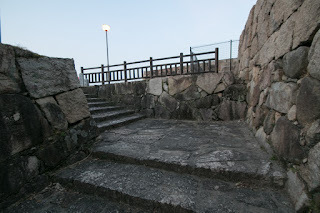 In 1587, Masanori was appointed as a lord of Imabari area which was a control point of marine transportation at Setonaikai sea, and reformed castles such as Kokufu castle or Kawanoe castle. 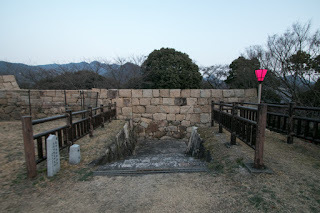 In 1595, Hidetsugu Toyotomi (1568-1595), a nephew and planned successor of Hideyoshi, was purged after the birth of Hideyori Toyotomi (1593-1615) who was the real son of Hideyoshi. 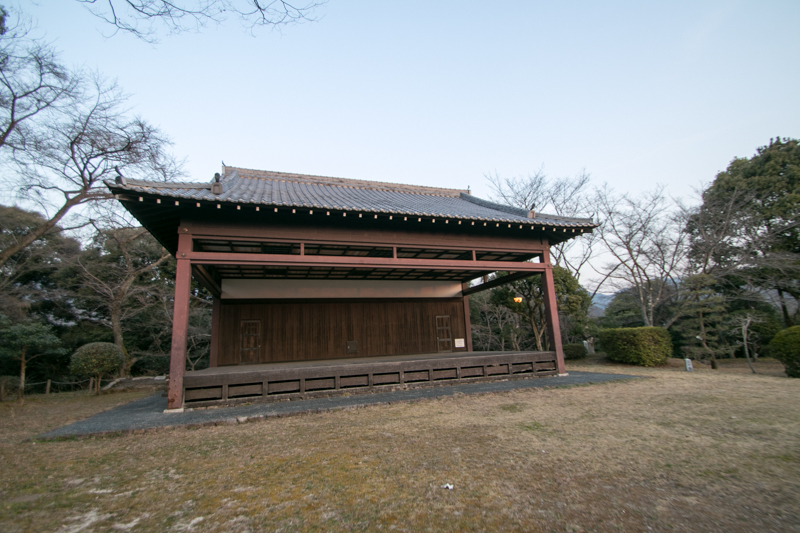 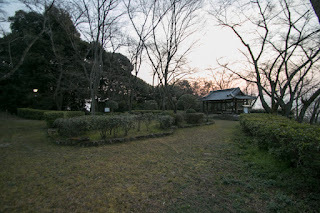 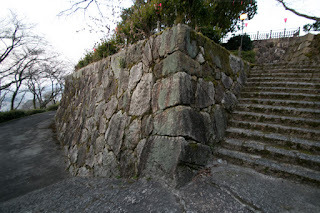 Masanori succeeded the large territory of Hidetsugu and became the lord of Kiyosu castle (Aichi prefecture). 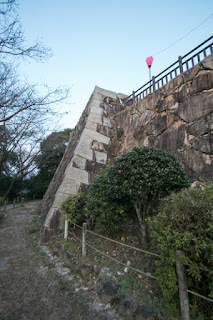 Hideyoshi expected Masanori to be the core of defense line against Ieyasu Tokugawa (1543-1616), the largest lord under Toyotomi government and once subordinated to Hideyoshi but also was expected to seek next hegemony after the death of Hideyoshi. 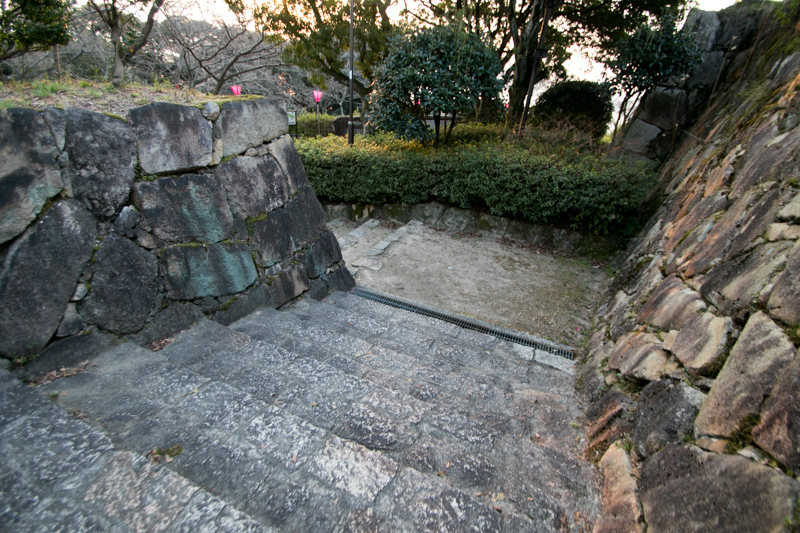 After the death of Hideyoshi in 1598, Ieyasu actually started his action aiming at next hegemony. 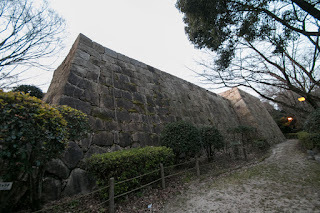 In response to this, Mitsunari Ishida (1560-1600), the chief administrative staff of Hideyoshi, raised his army against Ieyasu along with other large lords such as Mouri clan or Ukita clan to protect Toyotomi clan. 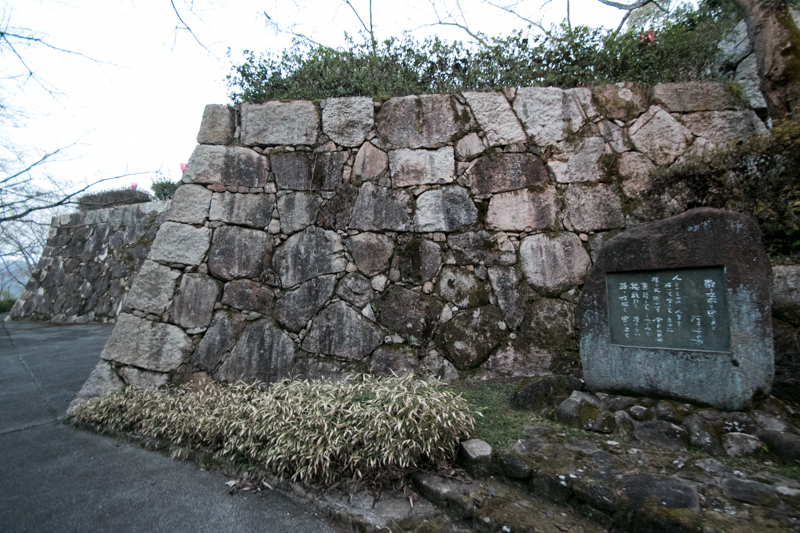 In principle, as a relative of Hideyoshi, Masanori had to make counteraction against Ieyasu along with Mitsunari. 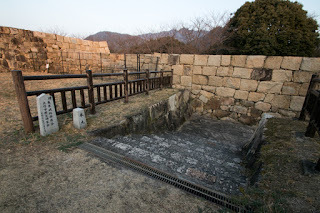 But the severe gap between front generals and administrative staff of Toyotomi government was unrecoverable because of the heavy burden for foreign expedition and factional strife. 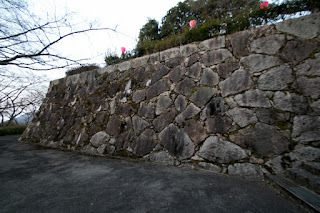 Just after the death of Hideyoshi, Masanori tried to assassinate Mitsunari, and Mitsunari who detected this plan asked help for Ieyasu and Ieyasu protected Mitsunari this time. 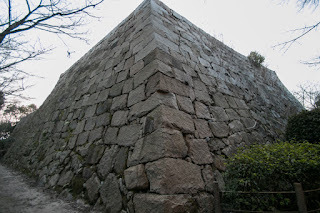 Of course this was not from good intention but to let this conflict continue and bring front generals to Ieyasu's side. In 1600, Mitsunari actually rose his army utilizing the expedition of Ieyasu against Uesugi clan at Aizu Wakamatsu castle. Mitsunari originally planned to make a defense line at Gifu castle and Ogaki castle (Gifu prefecture) and make time to capture whole Kinki region, and Ieyasu decided to return his army to central region and make a decisive battle against Mitsunari. Masanori positively supported Ieyasu, and as his territory at Owari province was next to Mino province, Masanori became the vanguard of Tokugawa army. 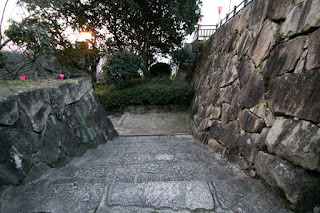 In august Masanori and Terumasa Ikeda (1565-1613) who was the lord of Toyohashi castle (Aichi prefecture) assaulted Gifu castle protected by Hidenobu Oda (1580-1605), the grandson of former ruler Nobunaga Oda (1534-1582), and fell it only in one day. 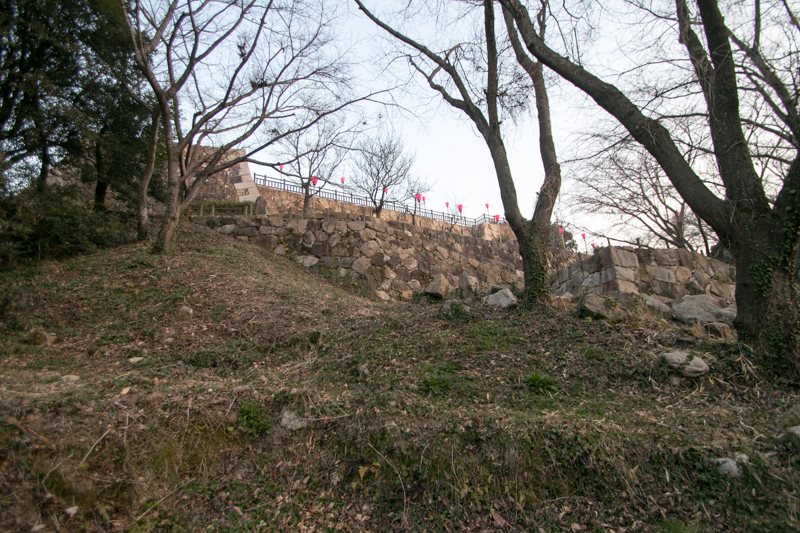 This capture of Gifu castle totally collapsed the strategy of Mitsunari, and Ieyasu proceeded his main army into Mino province and pretended to attack Kinki region. 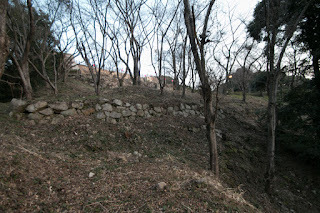 In response to this Mitsunari turned his army at the bottleneck of Sekigahara and made decisive battle, but because of the difference of commanding experience between Ieyasu and Mitsunari and secret betrayal of Ishida army, Ieyasu defeated Ishida army and won this decisive battle. 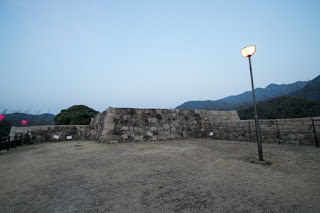 At this battle Masanori made a fierce battle against the army of Ukita clan, the strongest army of Ishida side which had larger number of soldiers than Masanori but made a even battle. 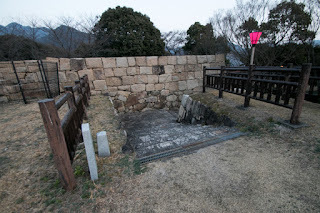 After the battle, being evaluated multiple achievement, Masanori was appointed as the large lord of Aki province and Bingo province, where was formerly the territory of Mouri clan but was confiscated. 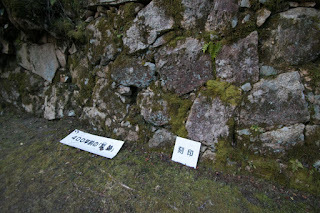 But new territory of Aki province and Bingo province was a wide territory separated into small basins by mountains. 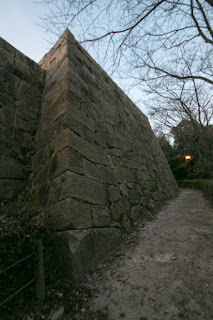 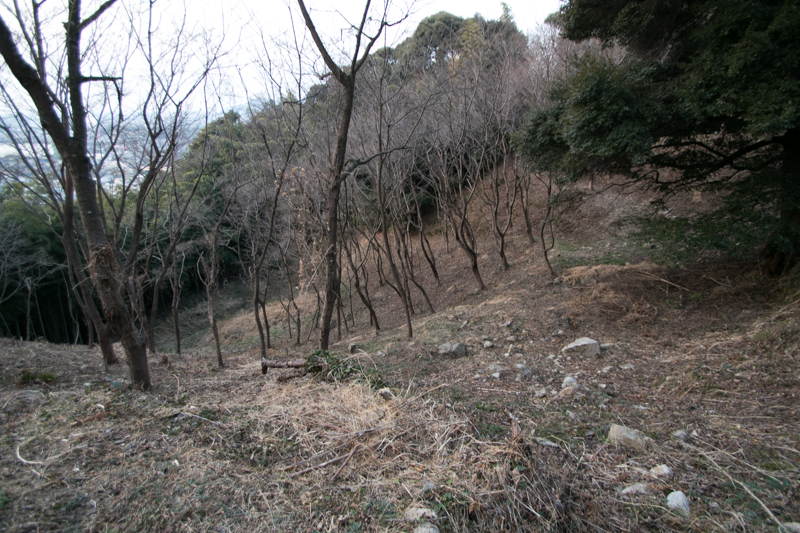 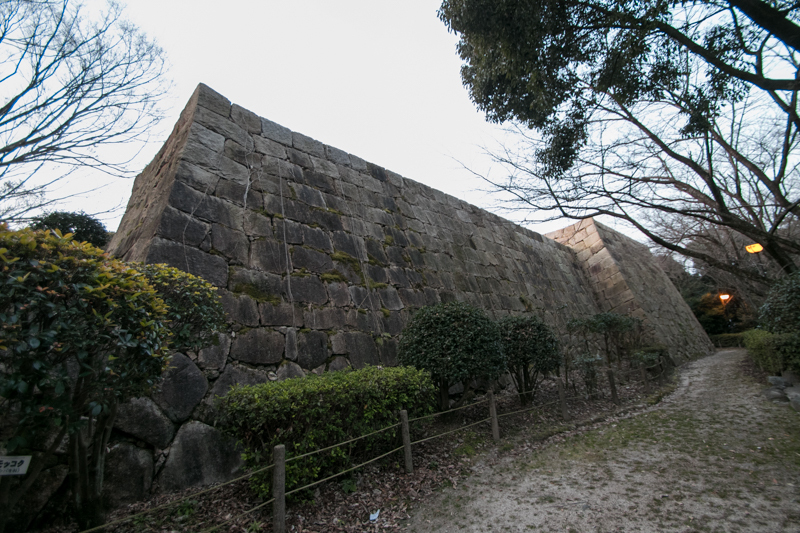 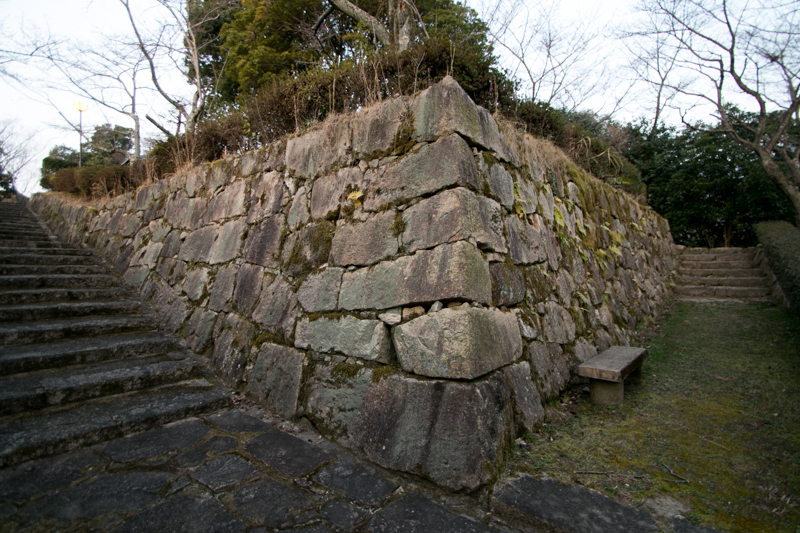 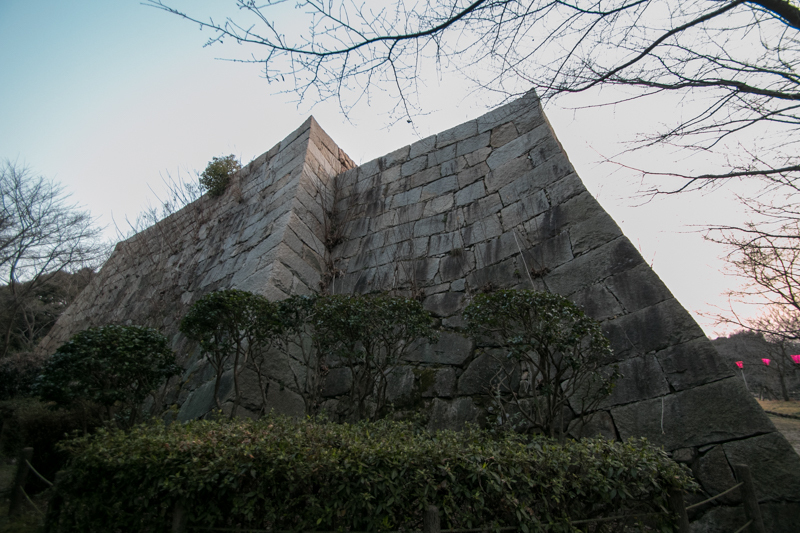 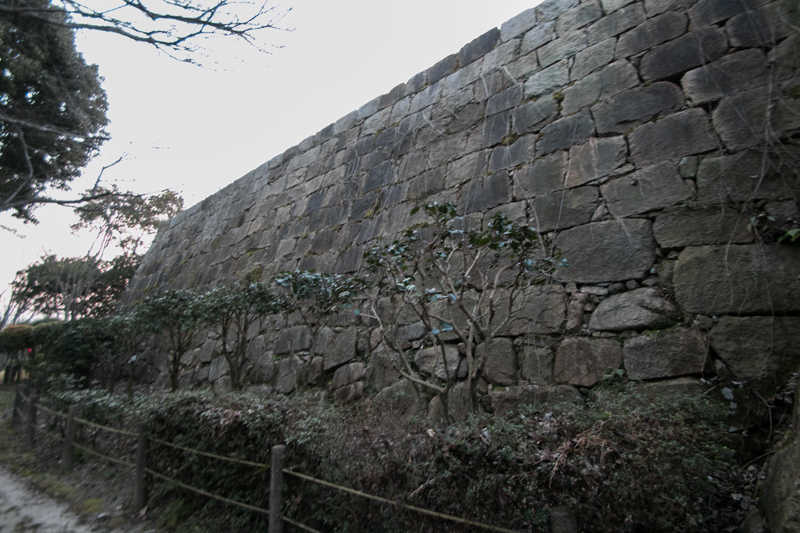 To protect his territory, Masanori needed branch castles at each area to gain time before the arrival of main army. 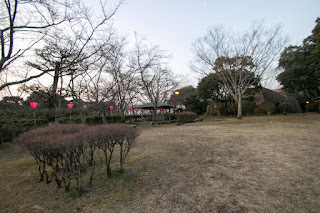 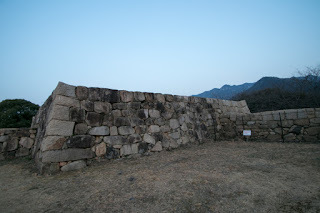 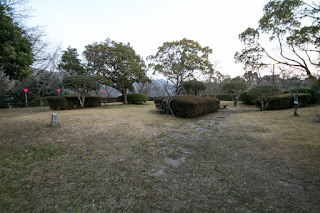 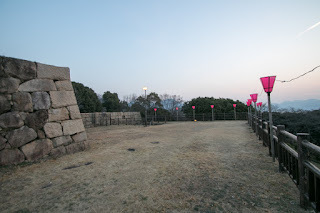 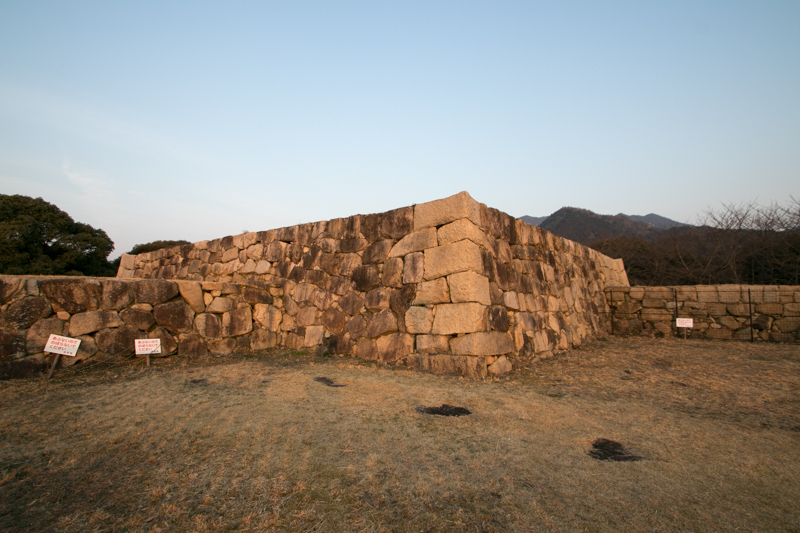 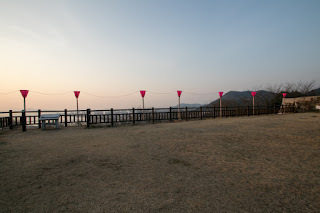 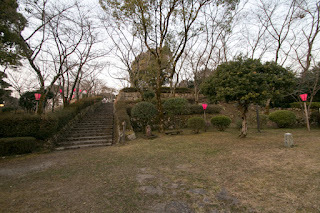 But Aki province and Bingo province had been a main area of Mouri clan and did not face any threat for long time, thus castles at these area were small and old and was not suitable for recent style of battles. 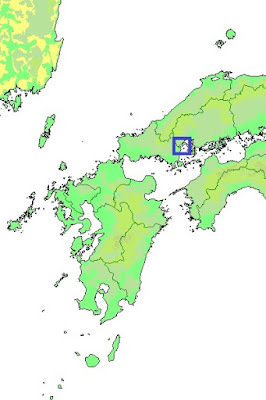 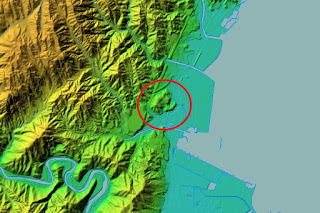 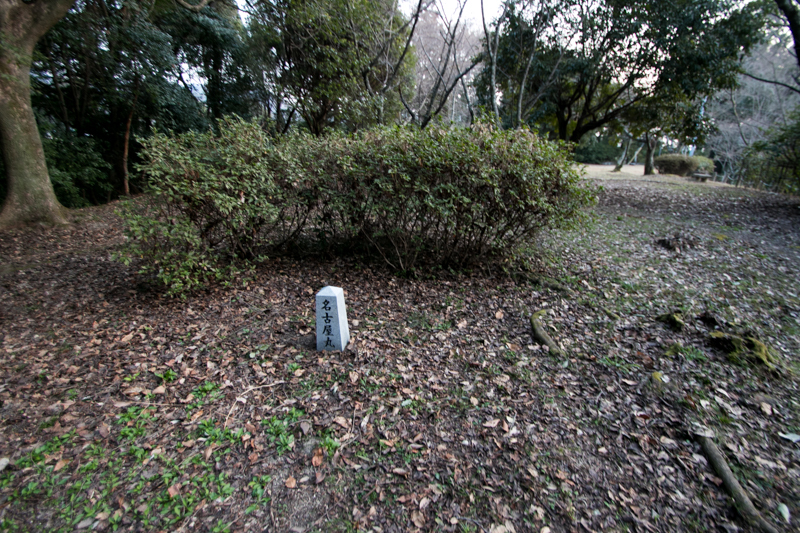 Looking at this situation, apart from his main base Hiroshima castle (Hiroshima prefecture), Masanori built six large branch castles such as Kamei castle, Ozekiyama castle at Miyoshi city, Gohongadake castle at Shobara city, Mihara castle at Mihara city, Kannabe castle and Tomo castle at Fukuyama city. 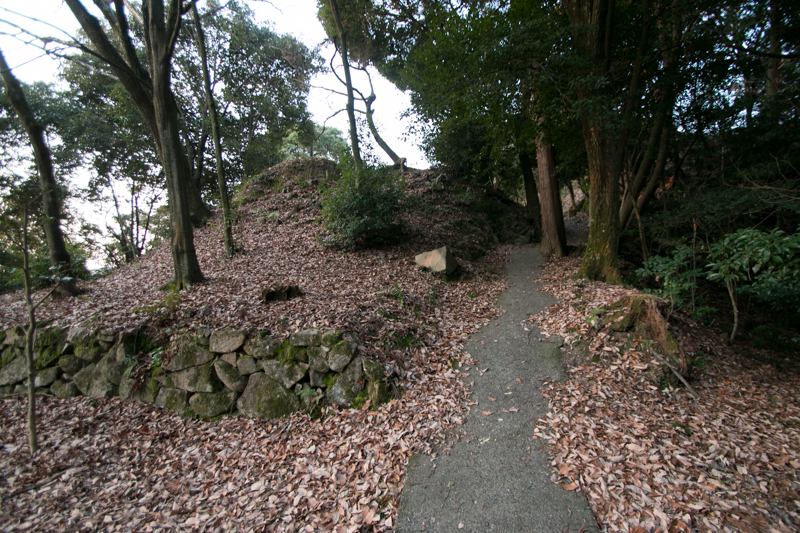 At this time, apart from Fukushima clan many large lords such as Kiyomasa Kato, Kuroda clan or Hosokawa clan built branch castles protected by stone walls, but such branch castle were small ones. 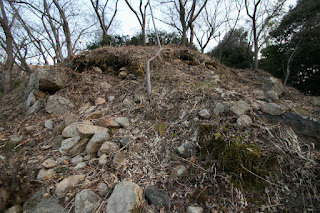 But branch castle built by Masanori were large and each equivalent to the main base of other lords. 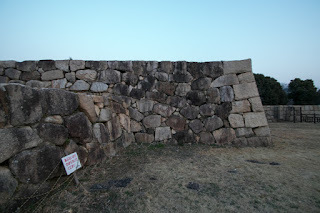 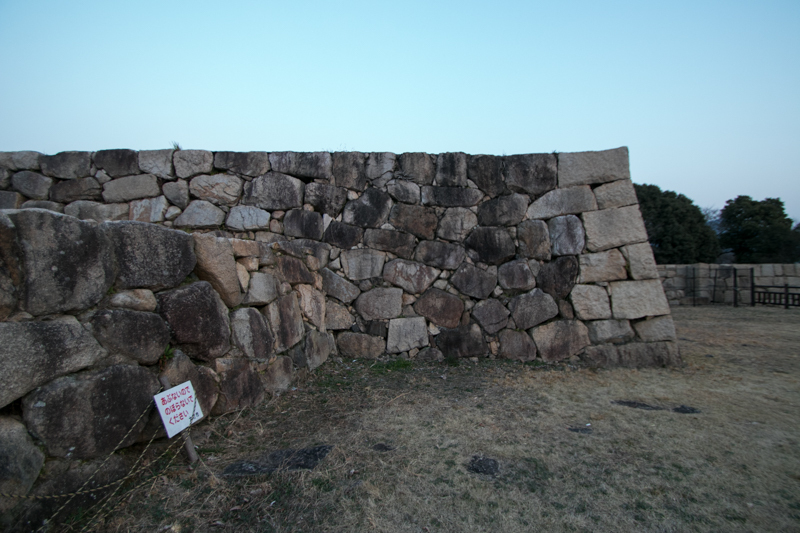 Especially Kamei castle which faced Suo province (Yamaguchi prefecture) was necessary to be secure one. 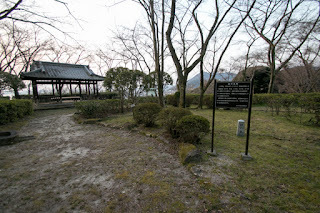 Suo province was the east edge of territory of Mouri clan, which lost Aki province and Bingo province substantially the breach of promise by Ieyasu, and might be thought to make revenge to recover their former territory. 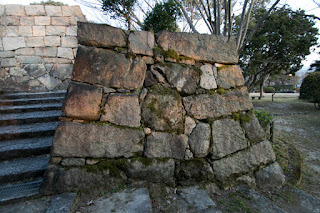 In addition to this, at Iwakuni area just four kilometer apart from the border, Hiroie Kikkawa (1561-1625) who lead the strong army from the period of Motoharu Kikkawa (1530-1586) built secure Iwakuni castle (Yamaguchi prefecture) as a front base. 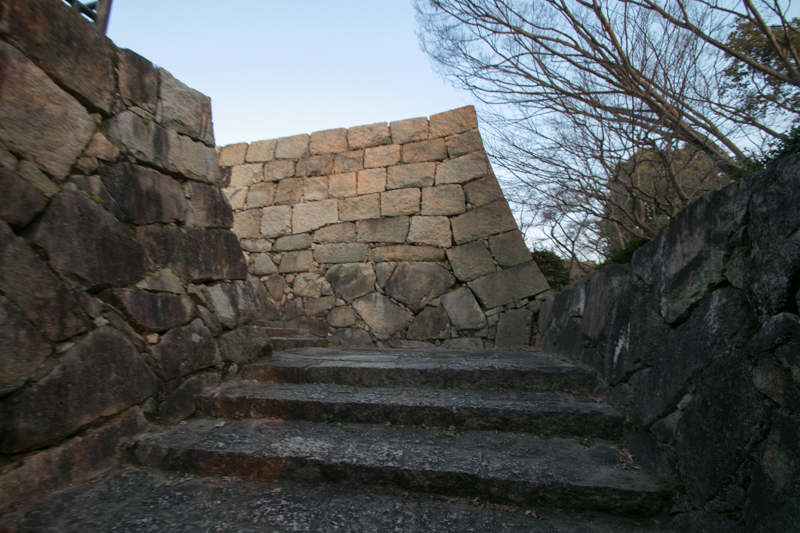 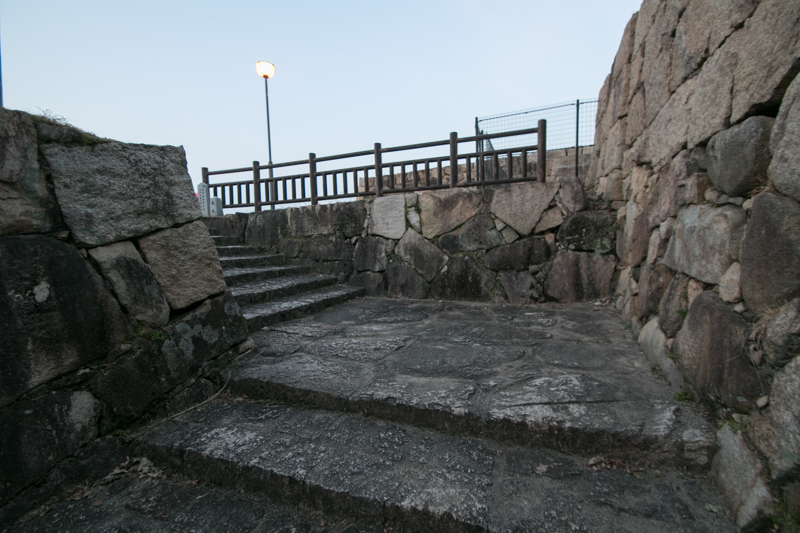 After five year construction, the construction of Kamei castle completed in 1608. 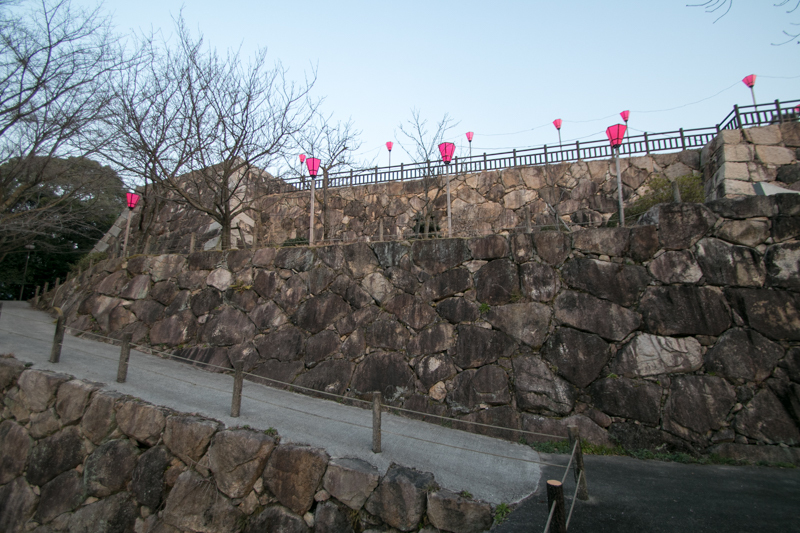 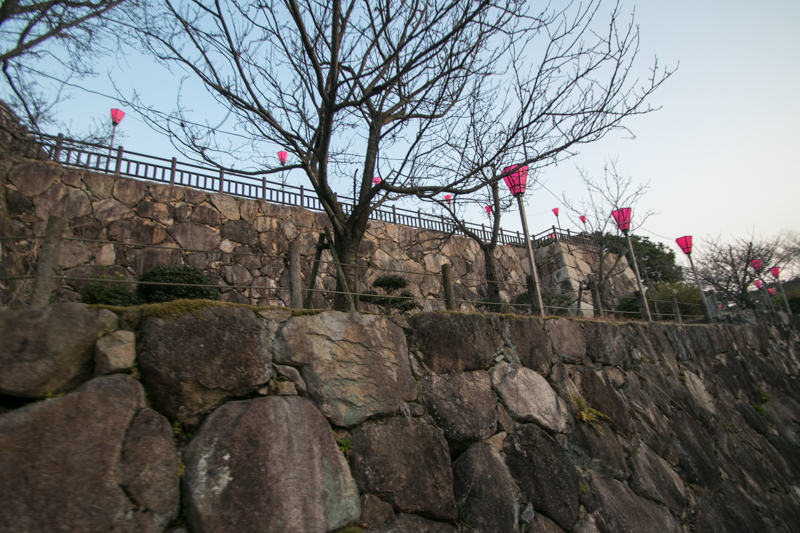 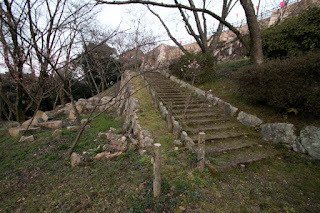 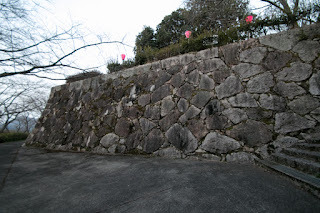 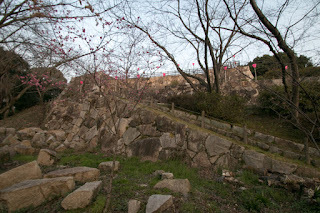 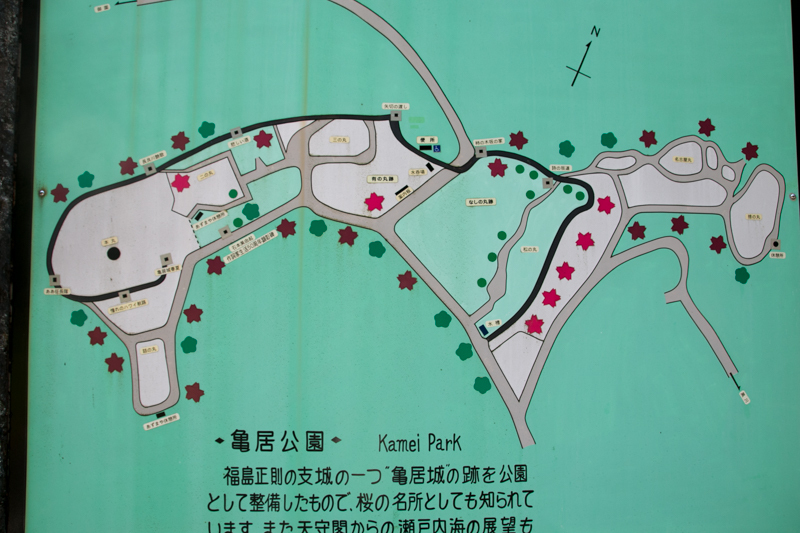 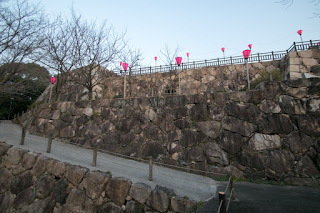 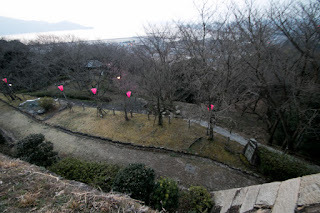 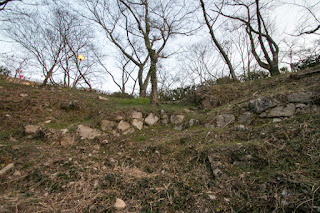 Kamei castle spreads along the hill gradually slope down from southwest to northeast. 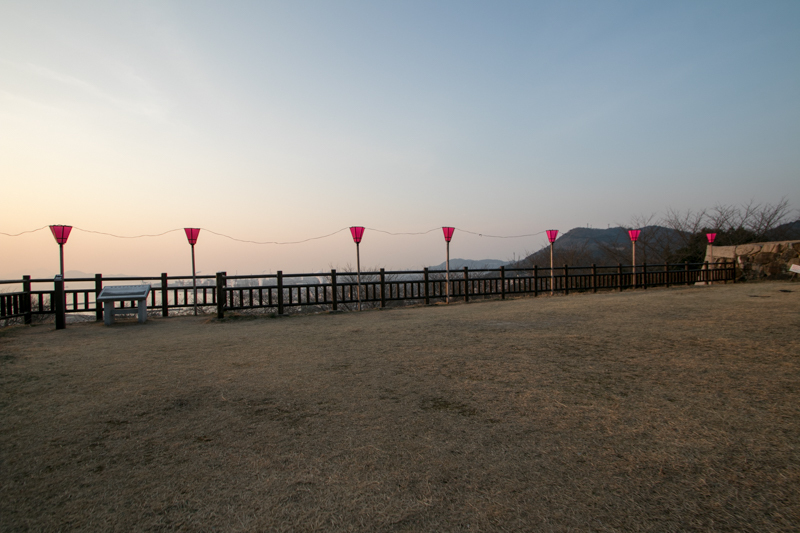 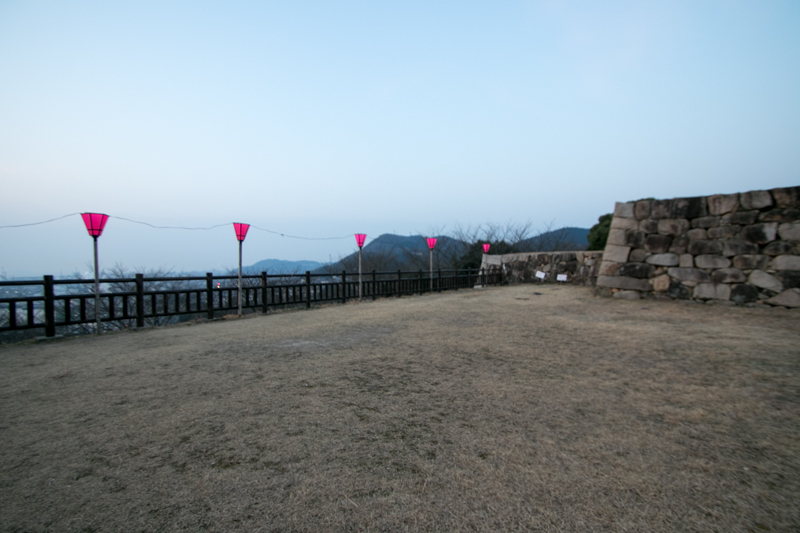 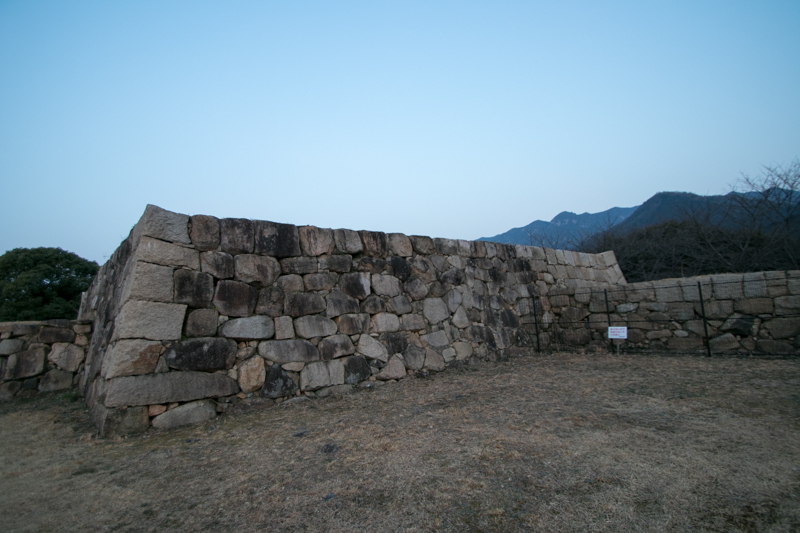 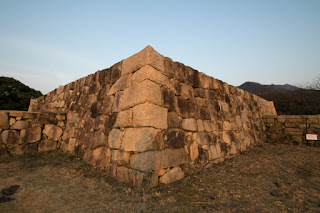 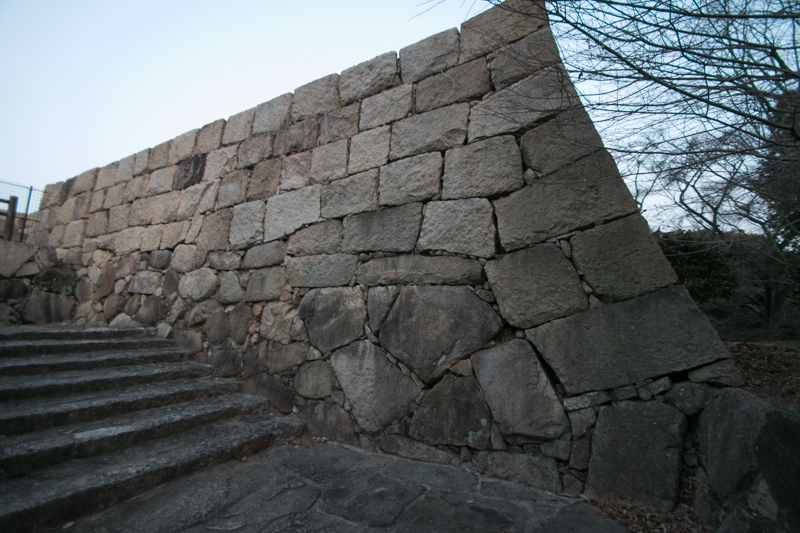 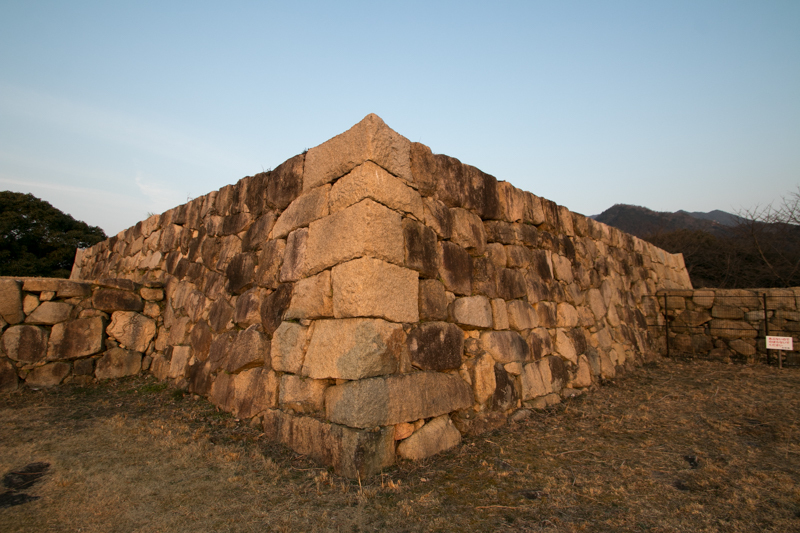 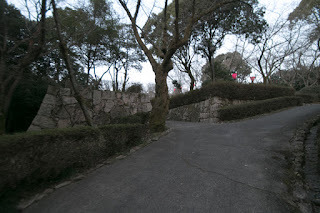 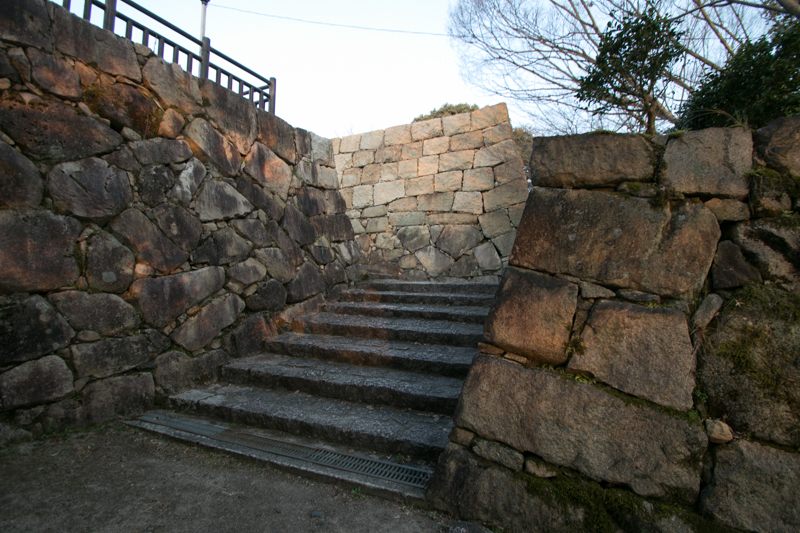 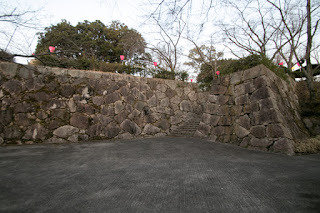 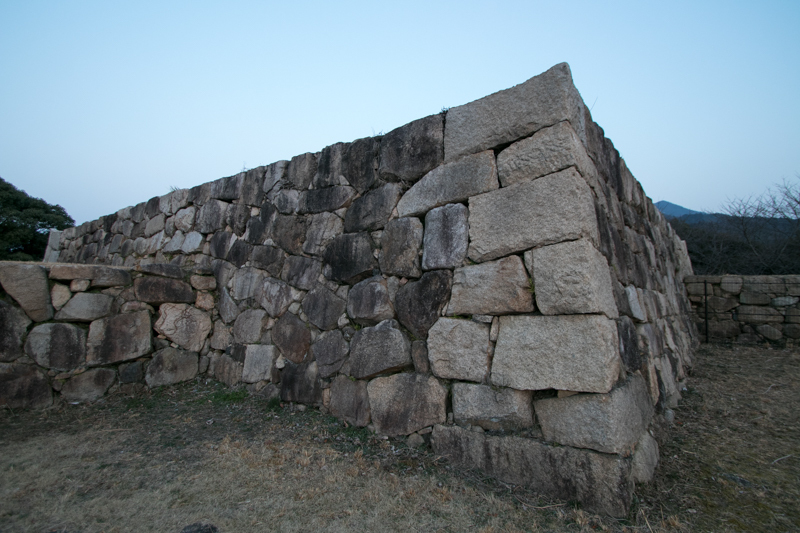 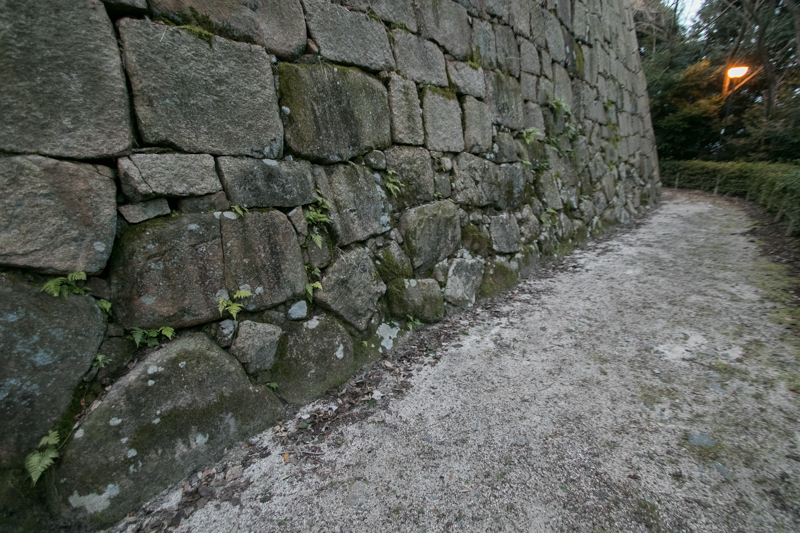 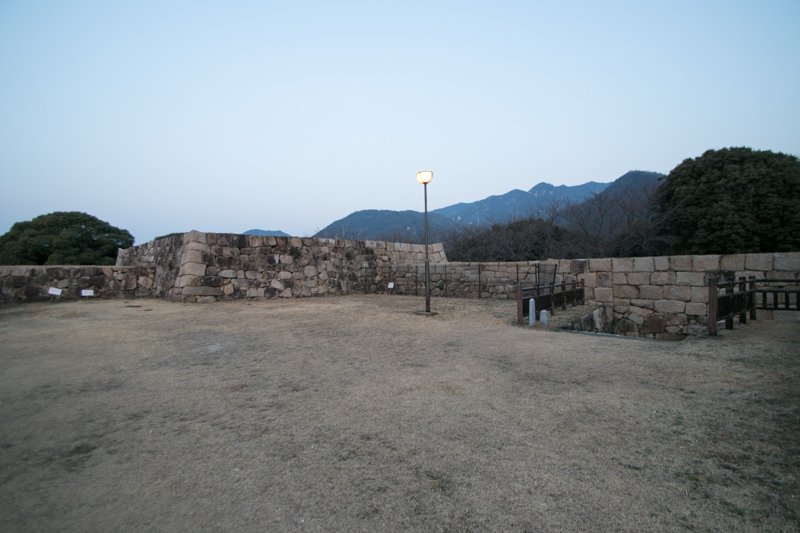 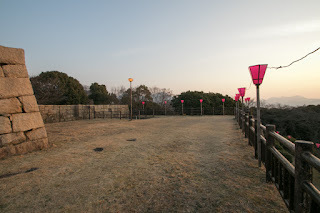 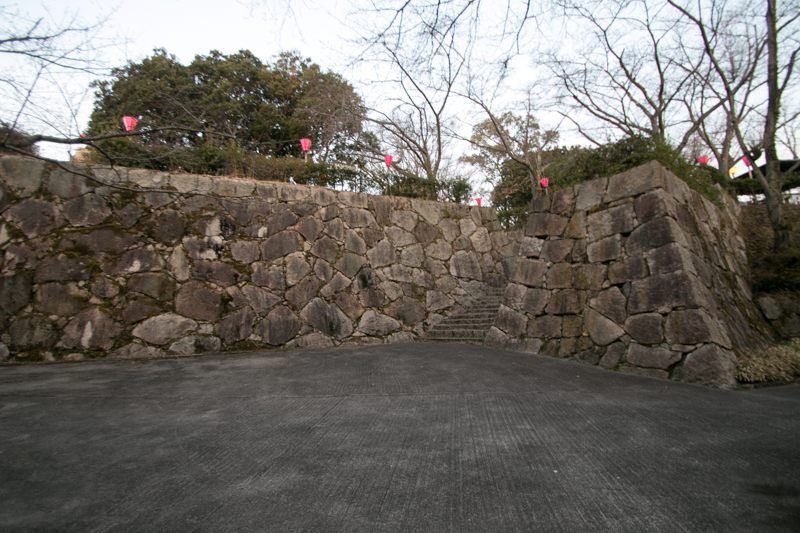 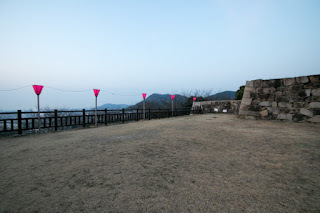 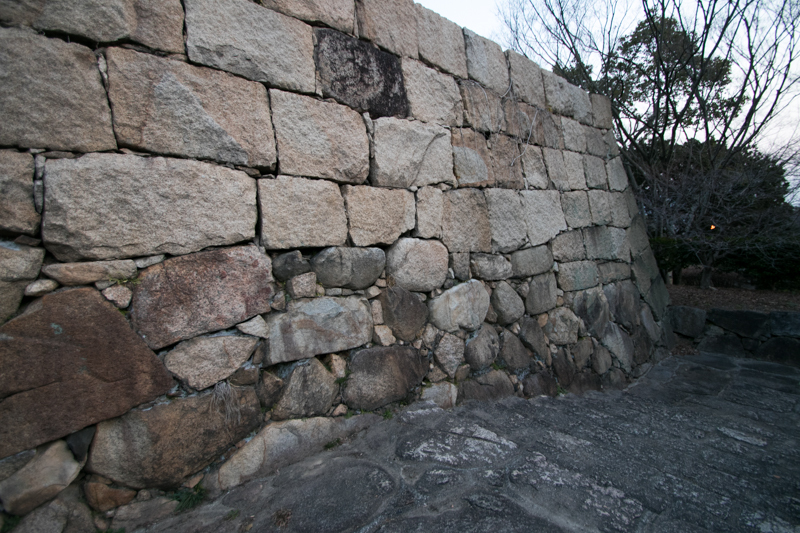 Central area of the castle is a square shaped area of 50 meter long, which was protected by tall stone walls. 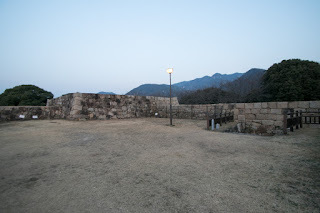 At each corner there were a three story main tower and four corner turrets connected by barrack turret, which was a same style of Himeji castle even though far smaller. 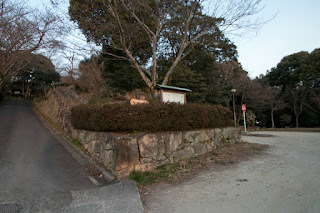 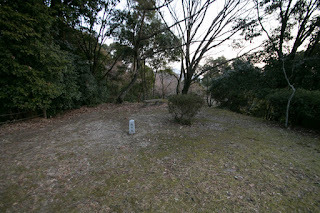 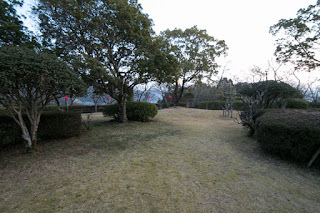 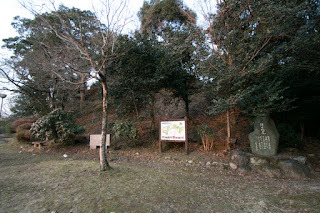 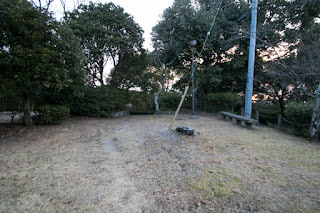 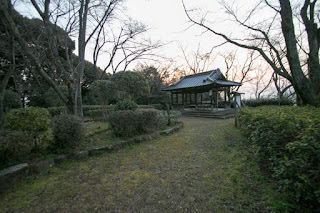 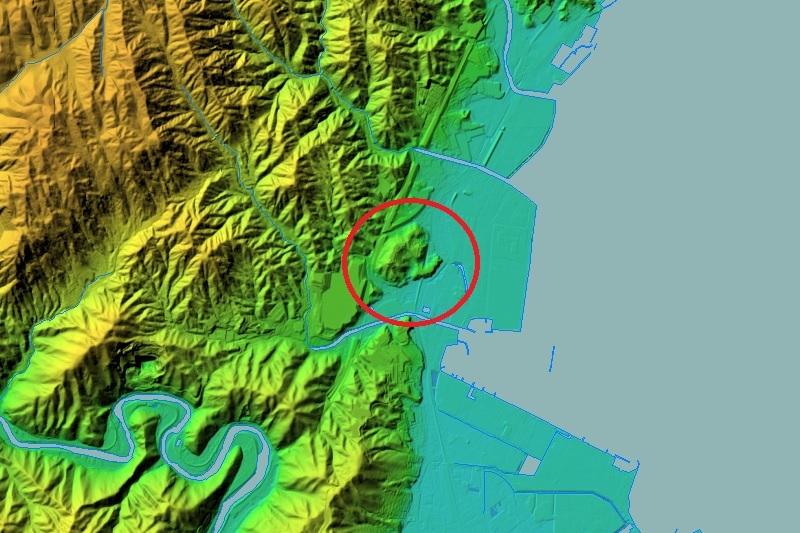 Next to central area, many areas such as secondary area, third area, Arinomaru area, Nashinomaru area, Matsunomaru area, Nagoyamaru area and Minaminomaru were built along the ridge in line. 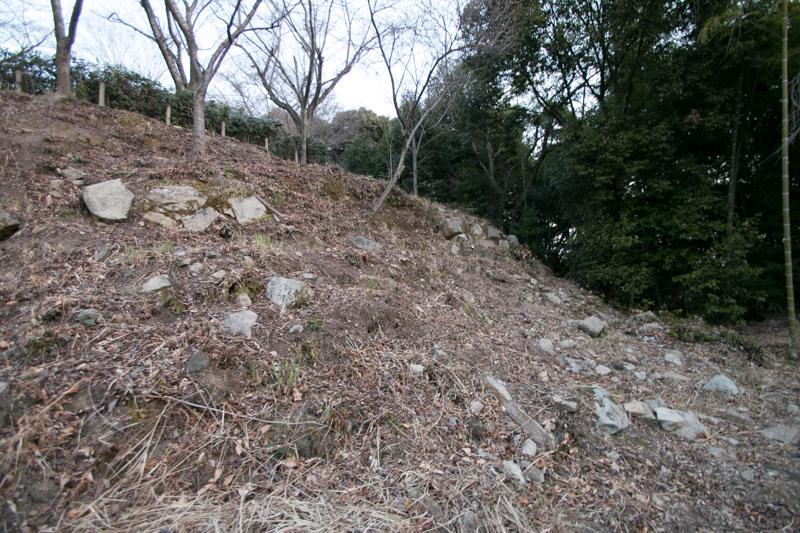 Each area is not so large but had a height difference from lower area and defense side attack climbing army from upper side. 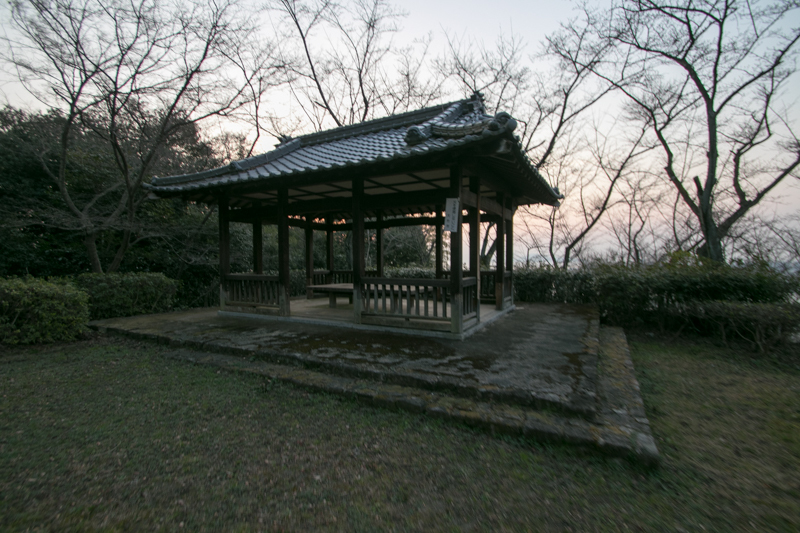 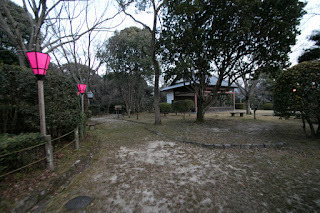 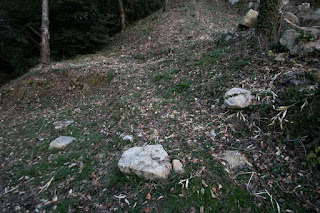 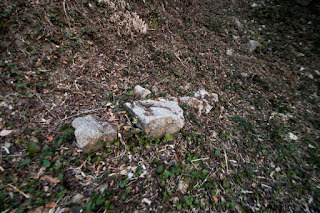 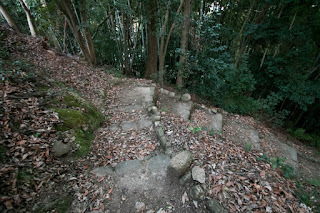 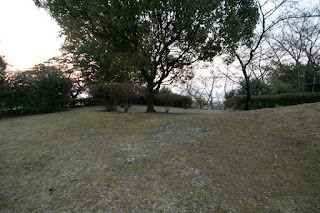 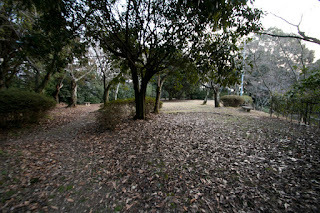 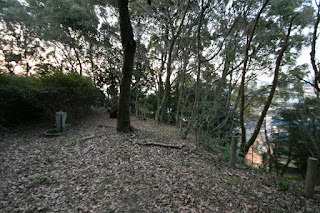 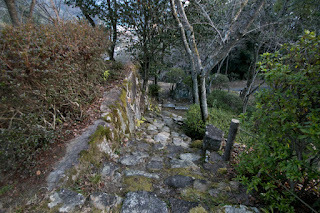 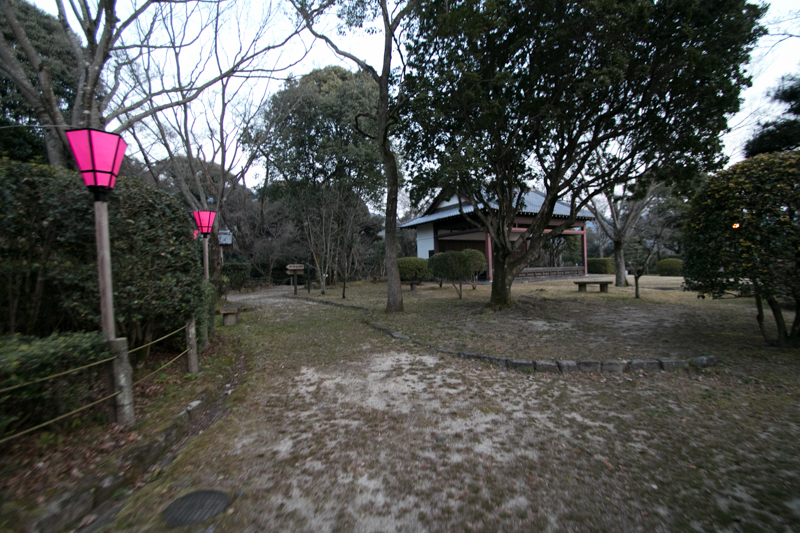 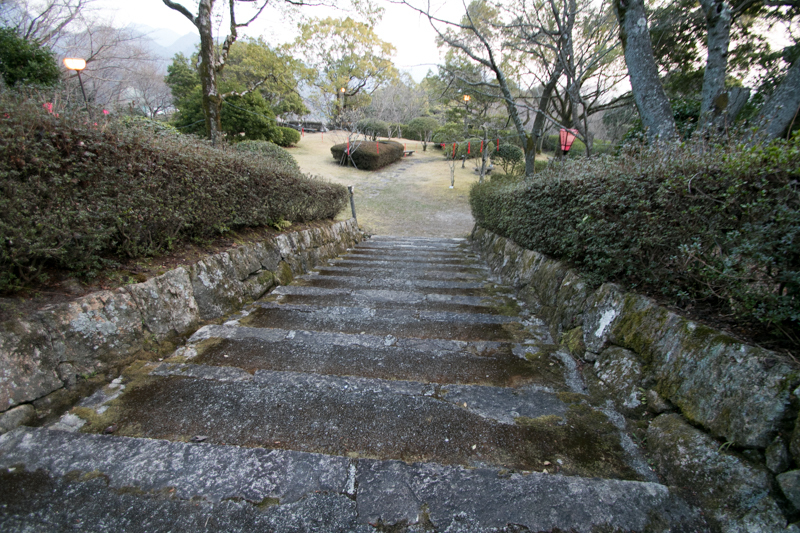 At another ridge separate from the middle of main ridge, there was Kanenomaru area which might be used as a residence of the lord. 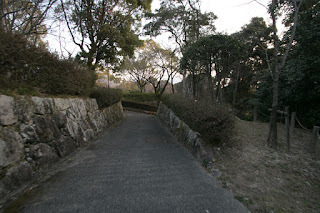 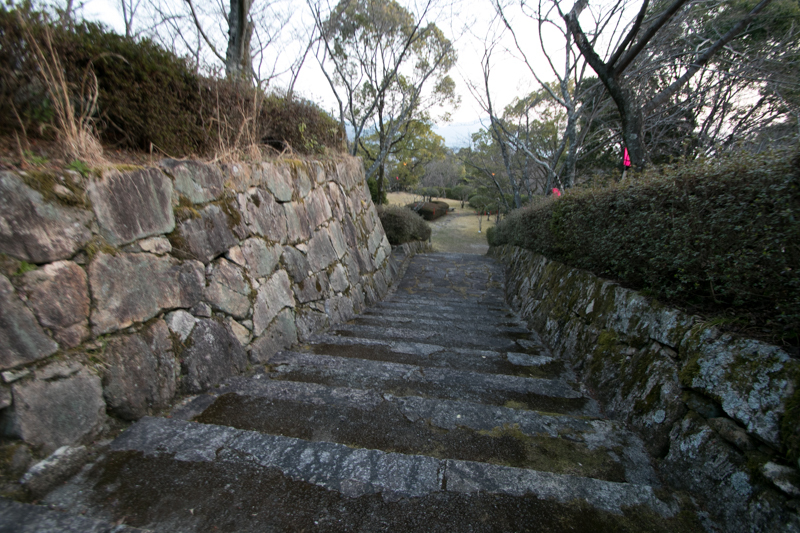 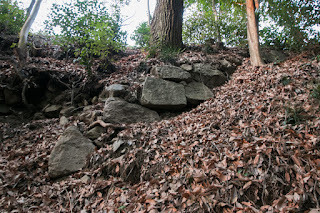 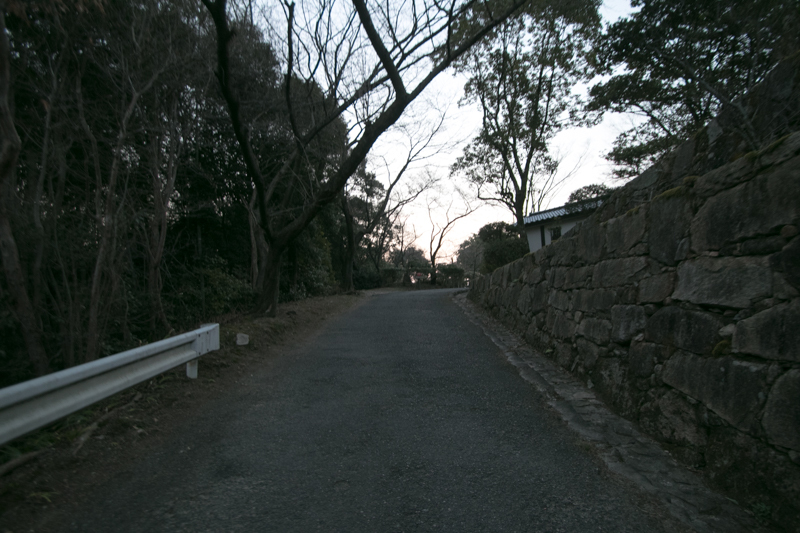 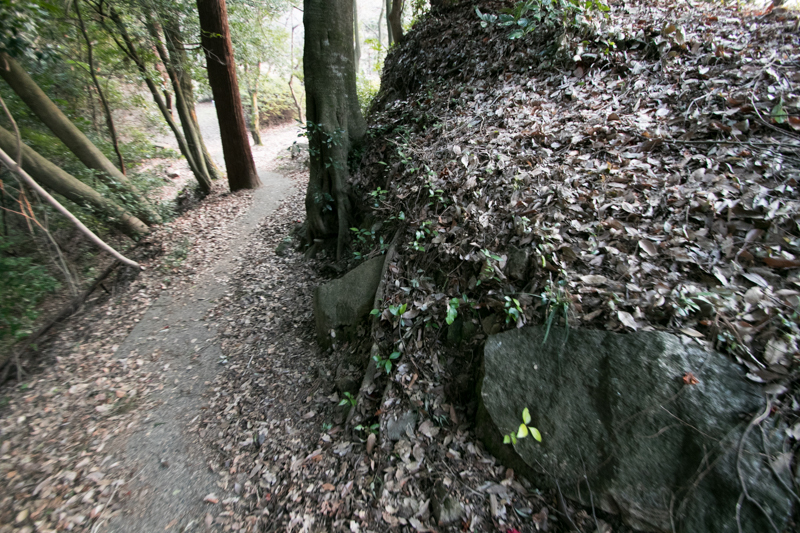 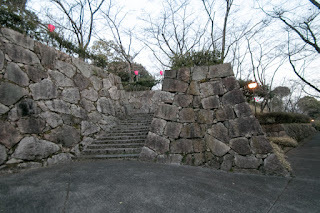 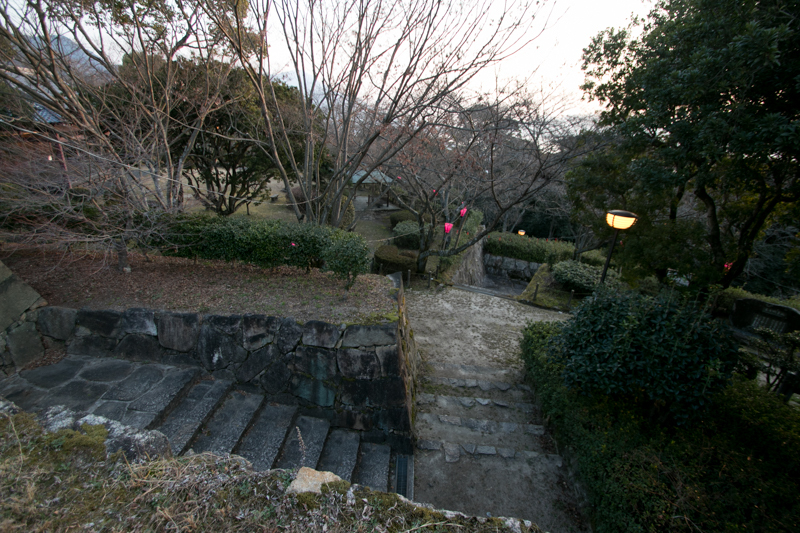 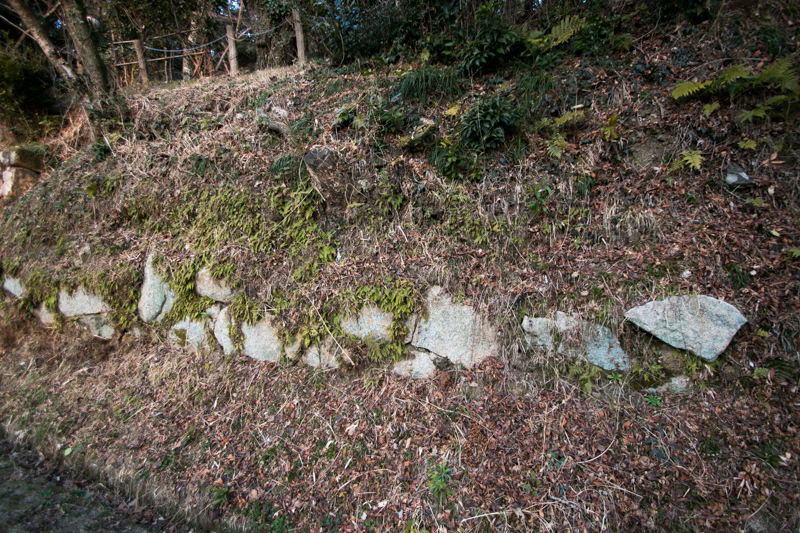 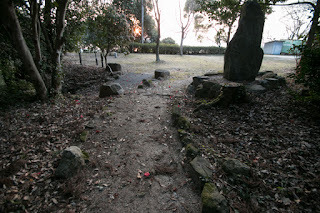 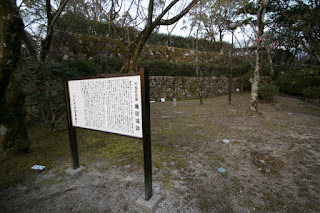 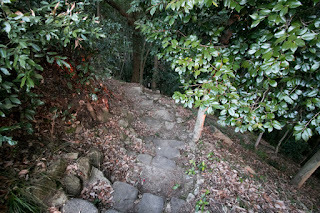 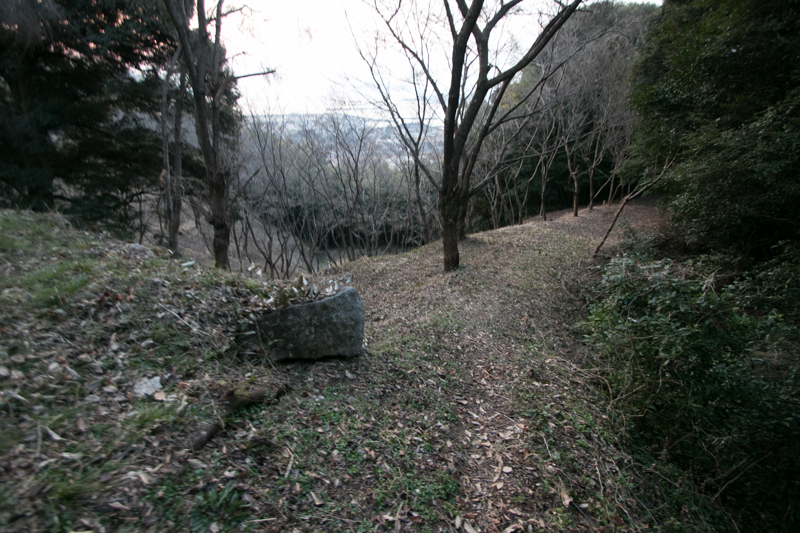 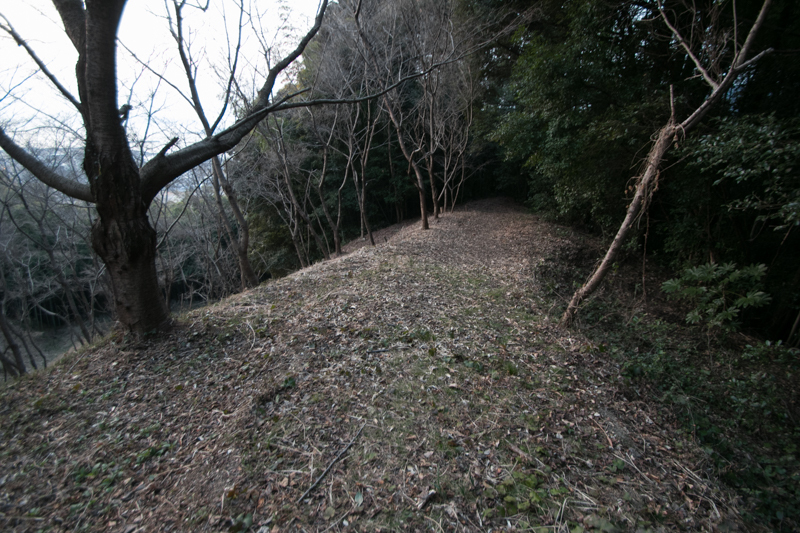 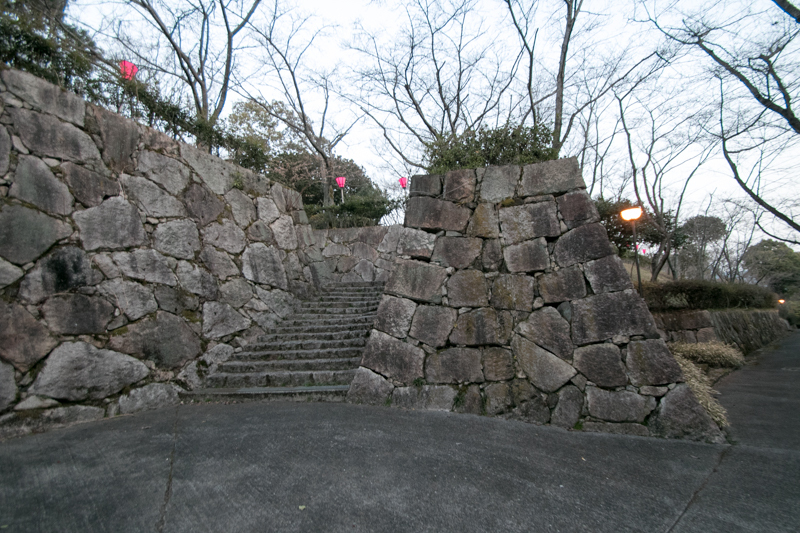 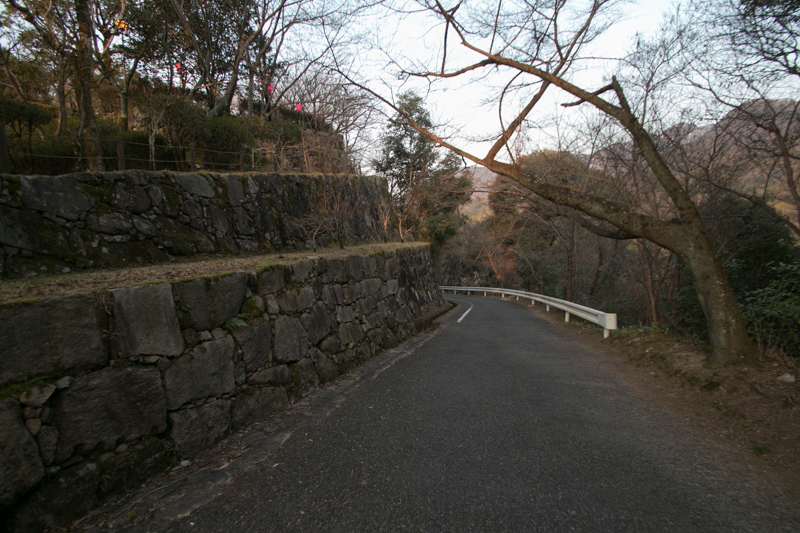 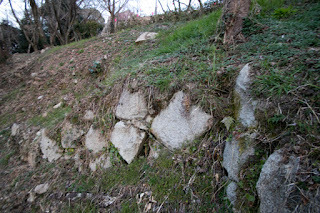 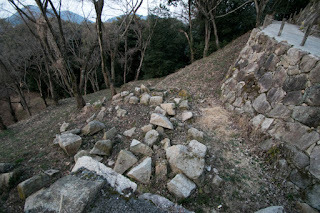 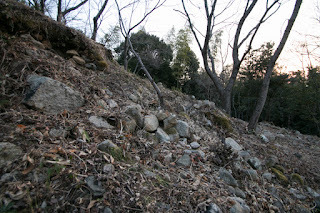 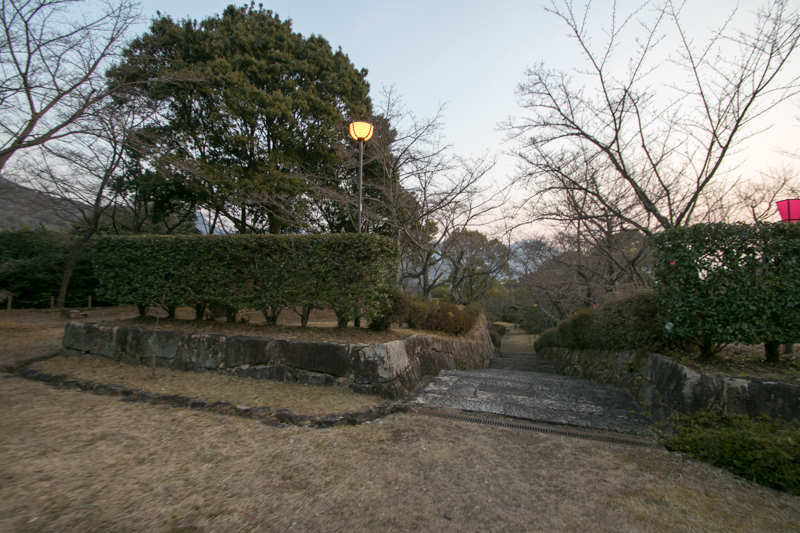 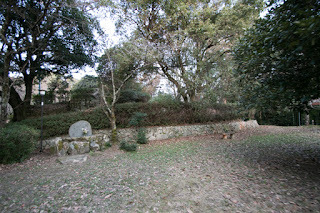 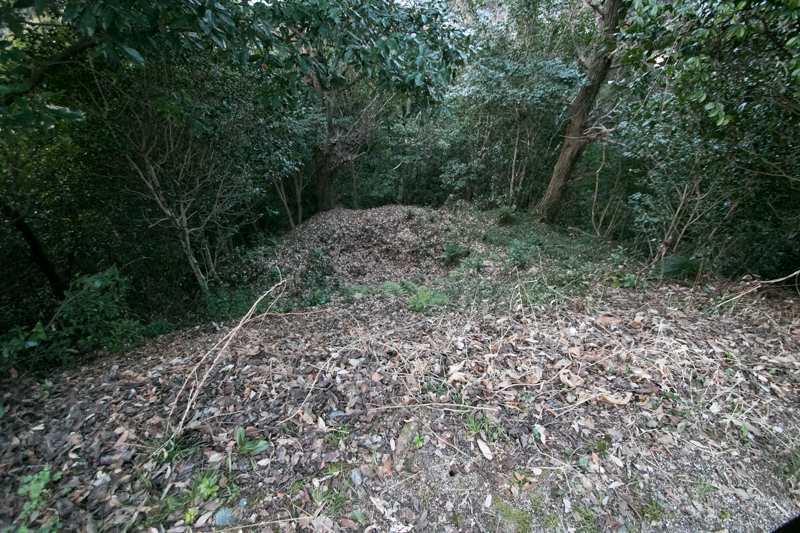 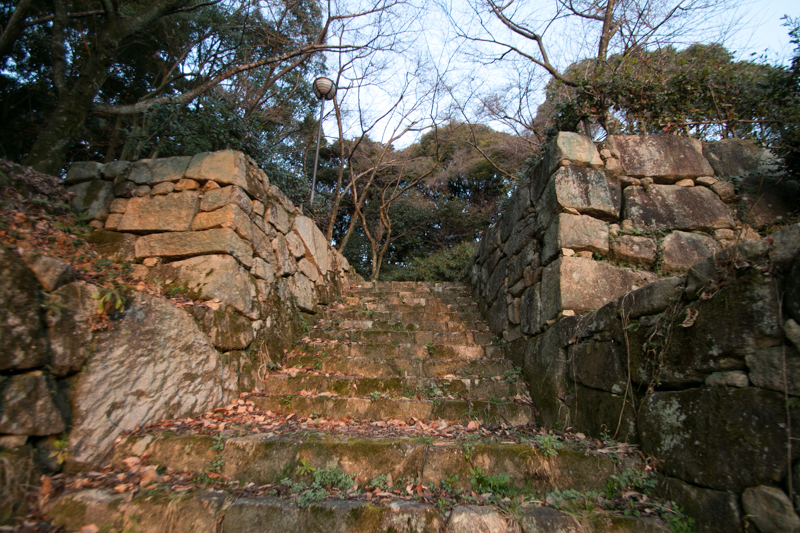 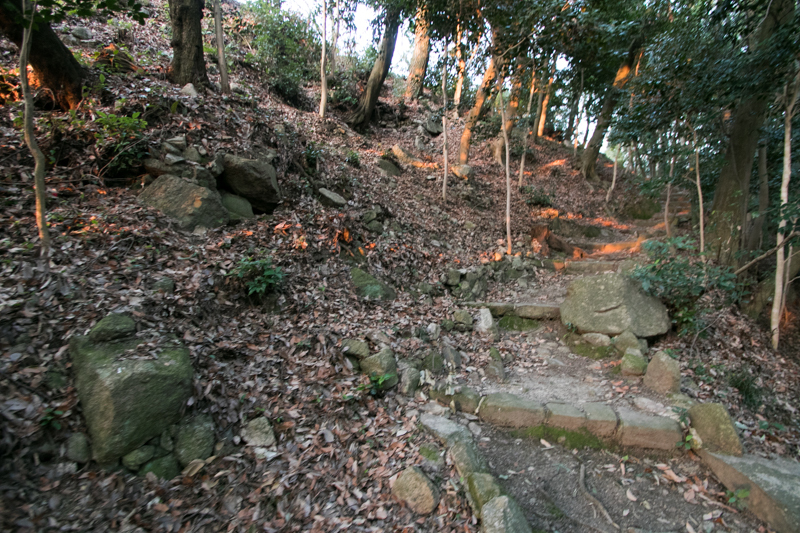 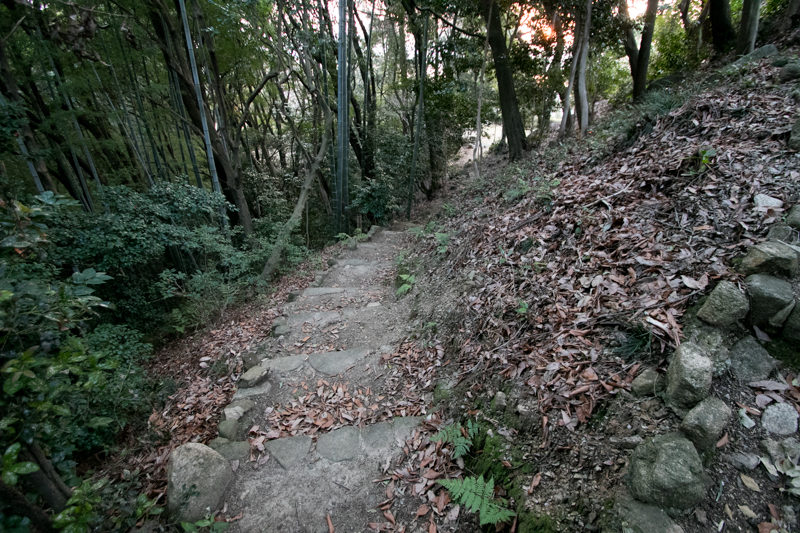 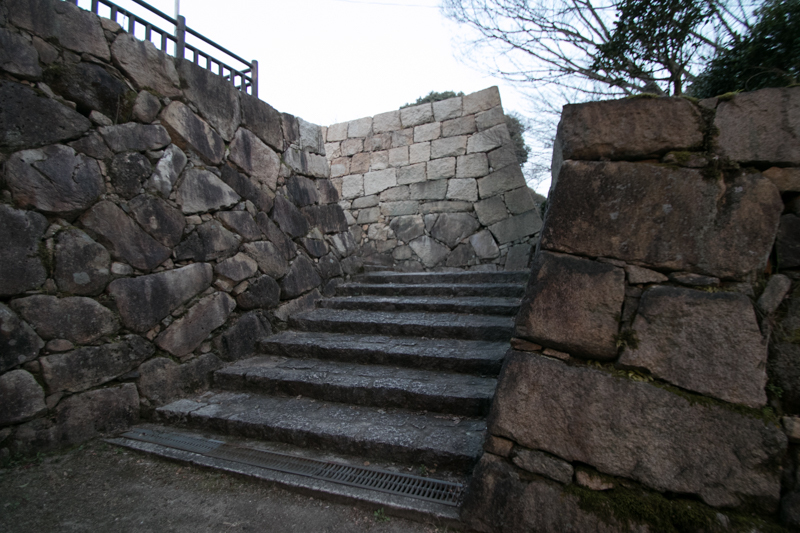 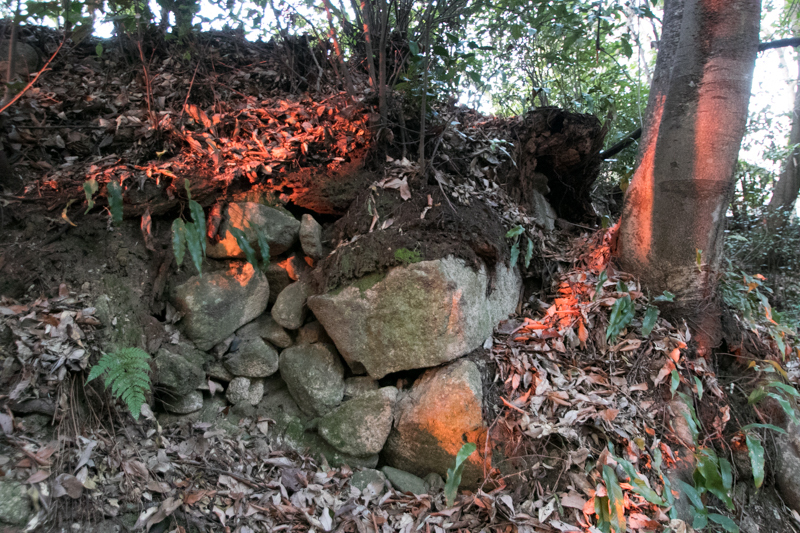 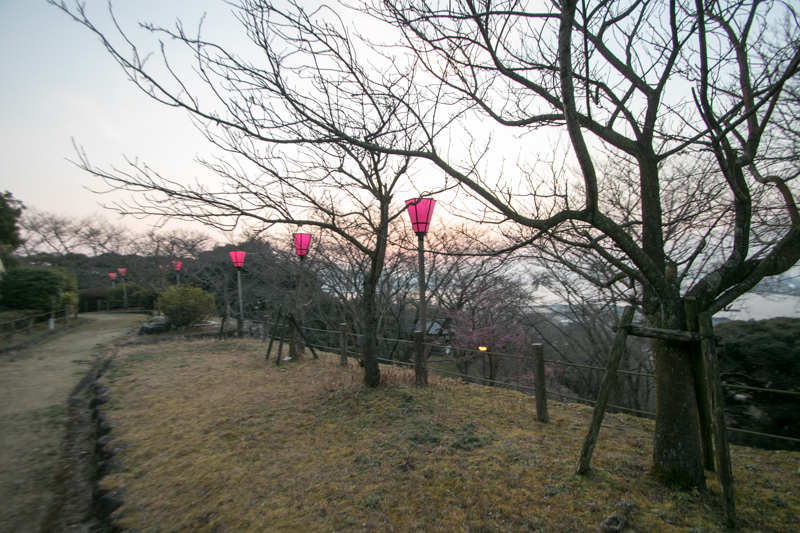 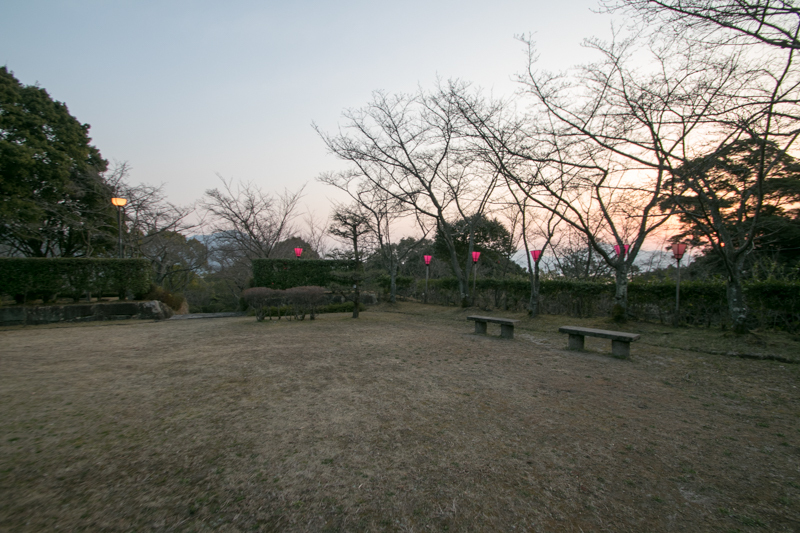 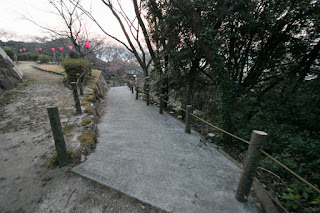 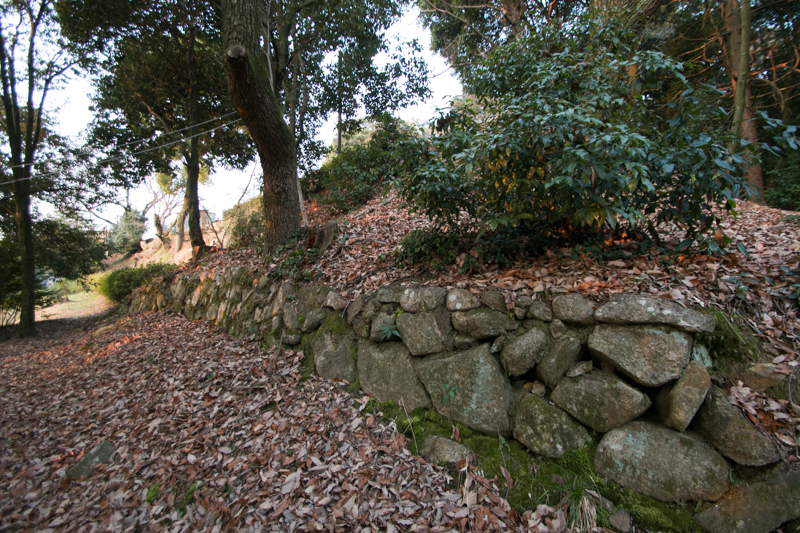 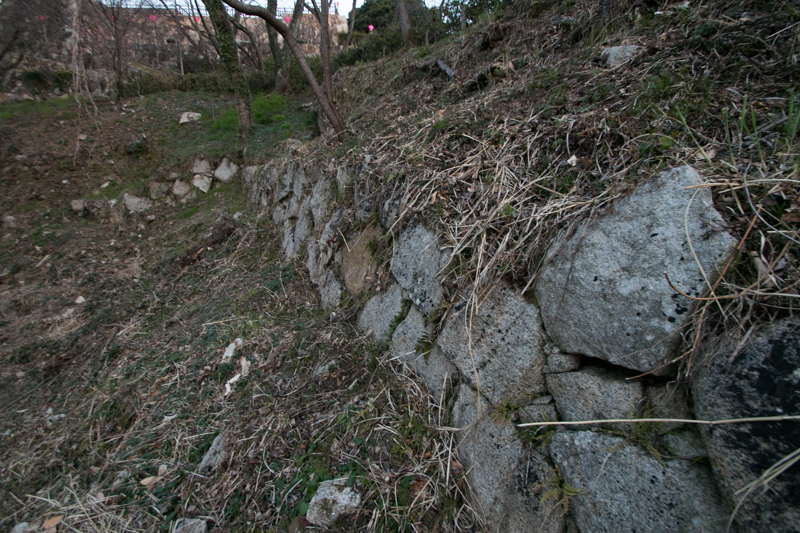 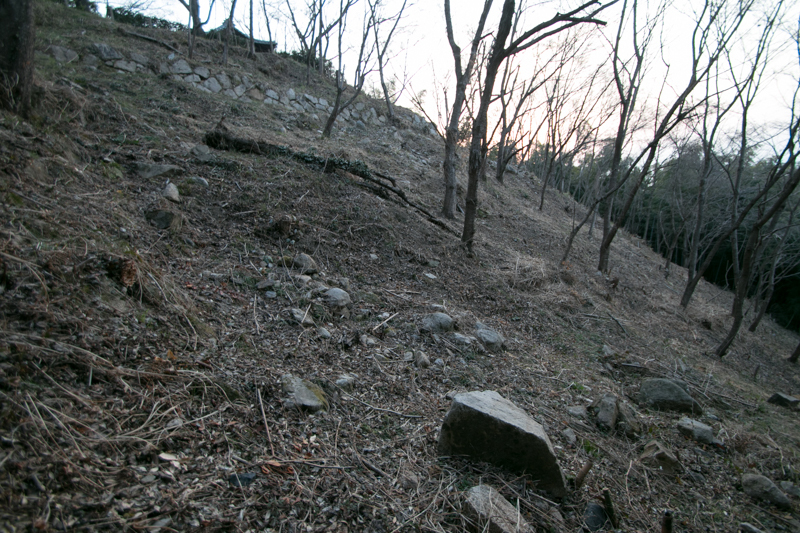 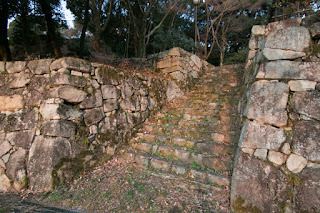 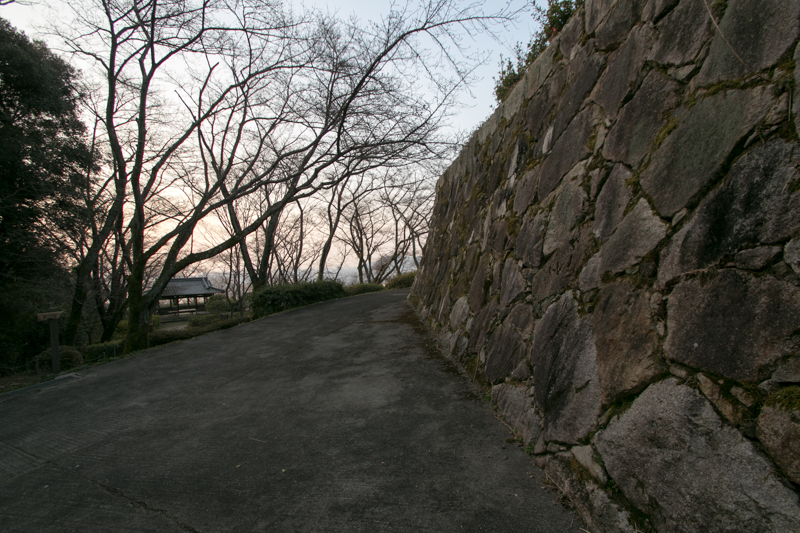 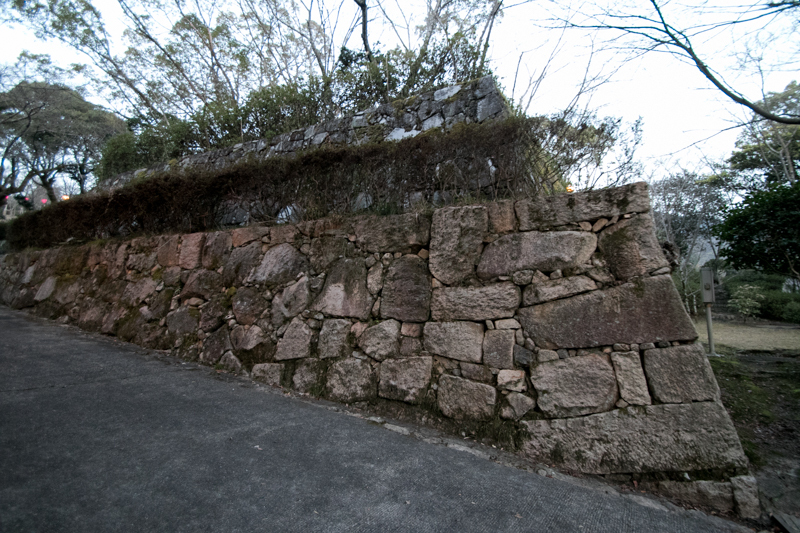 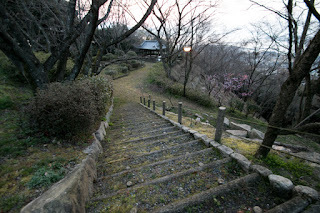 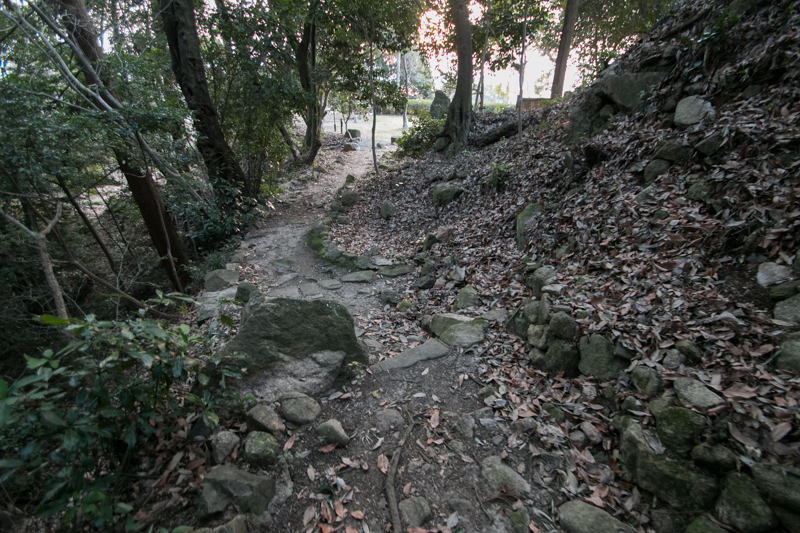 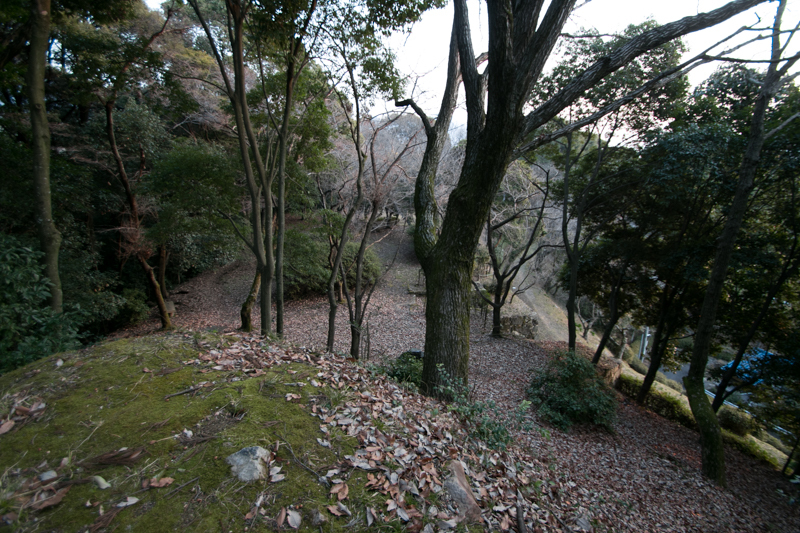 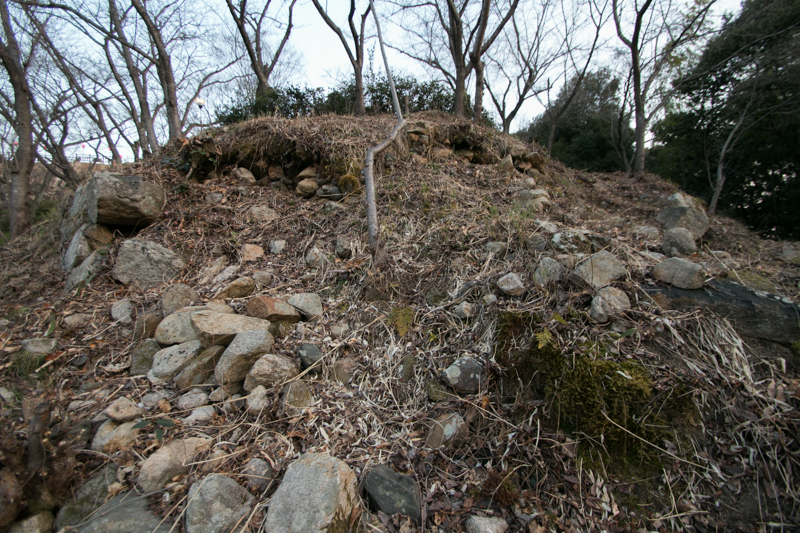 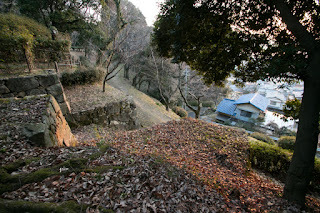 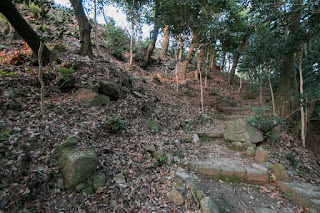 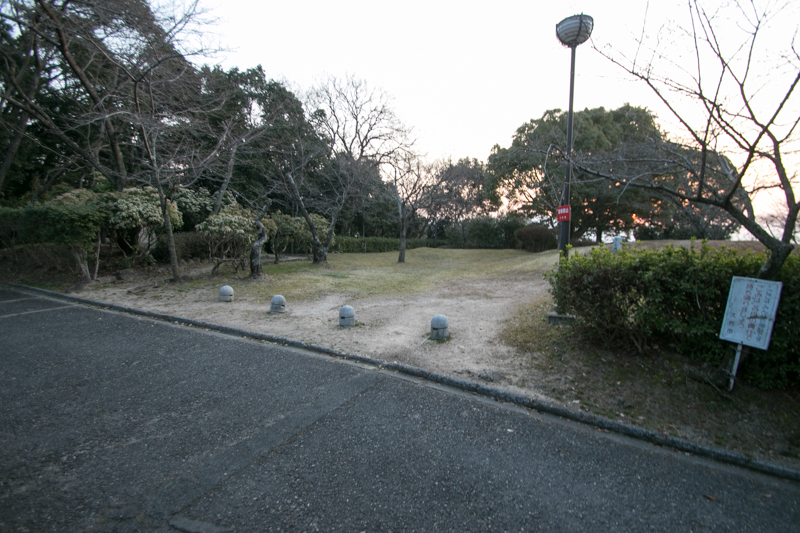 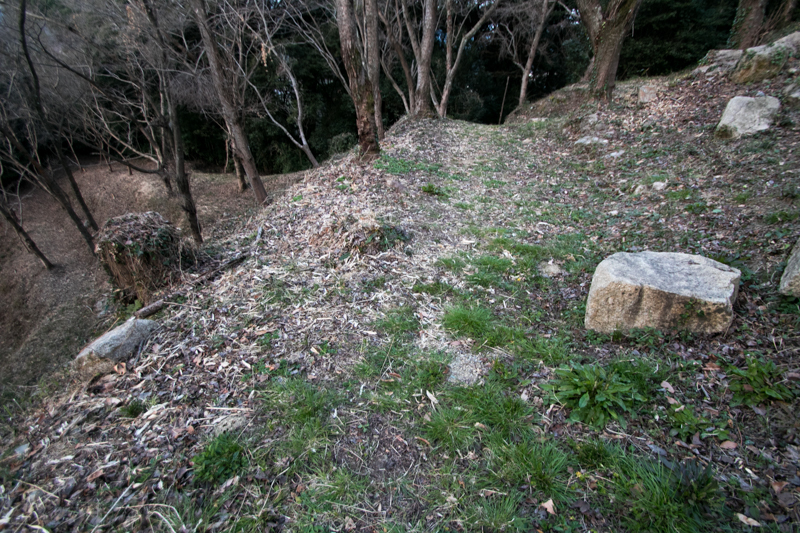 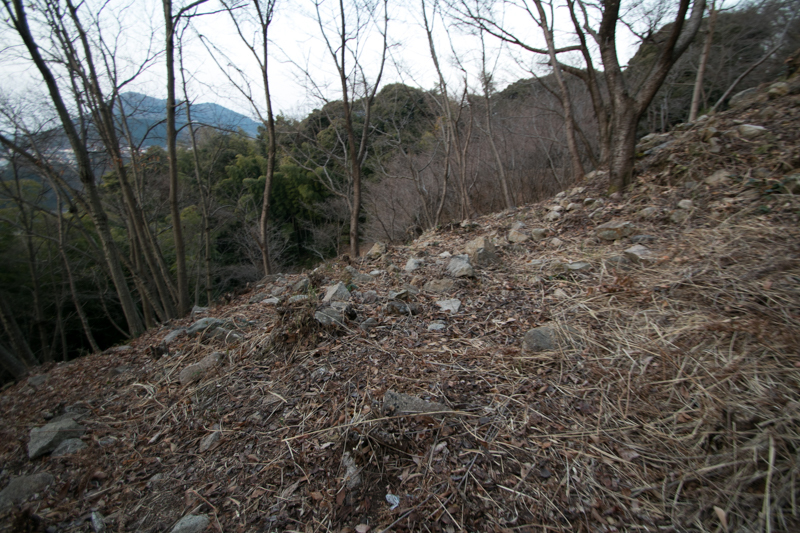 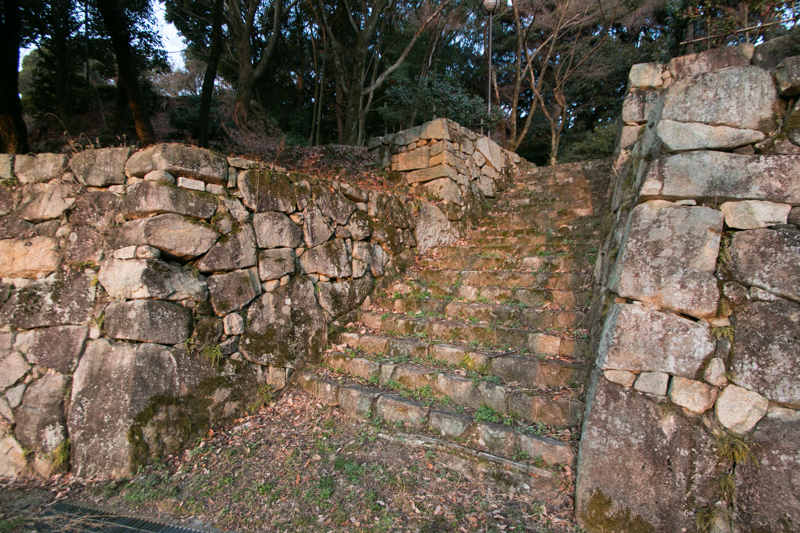 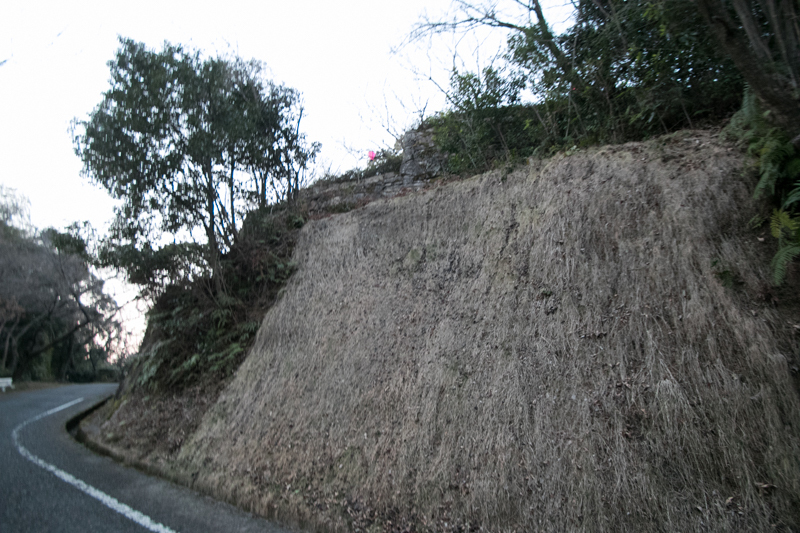 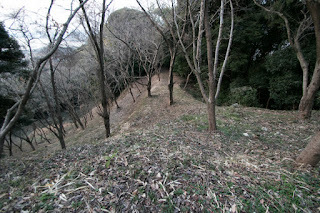 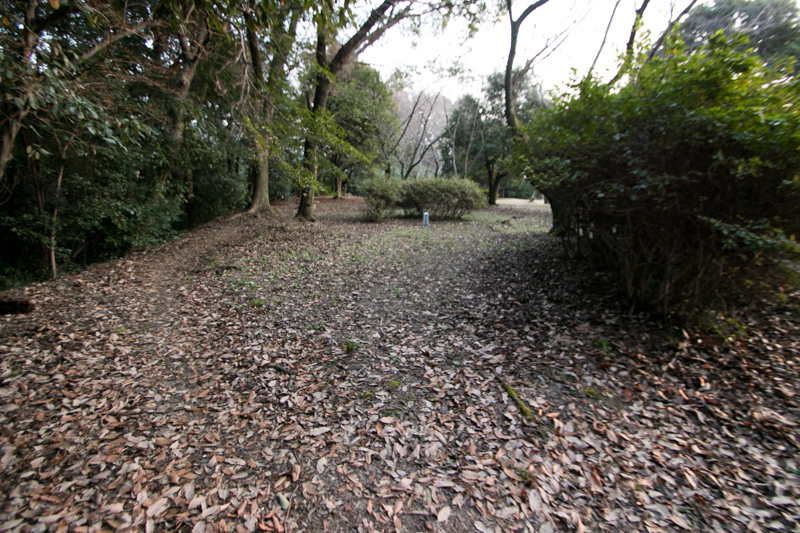 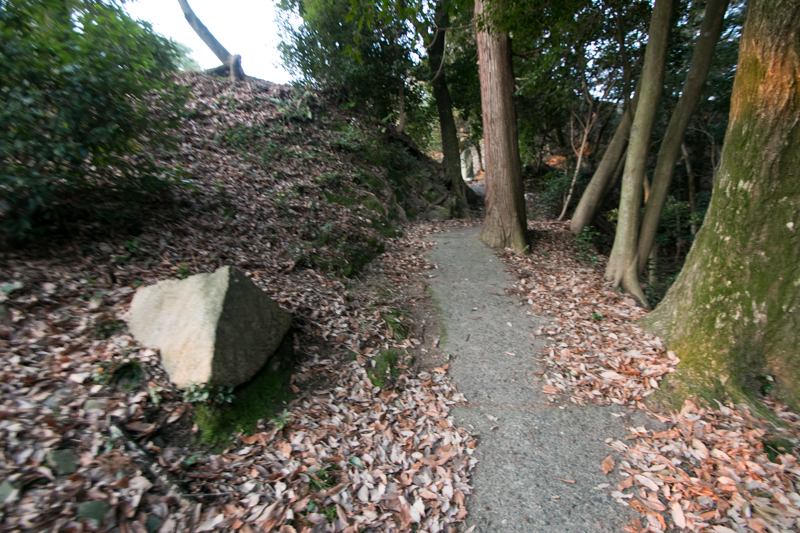 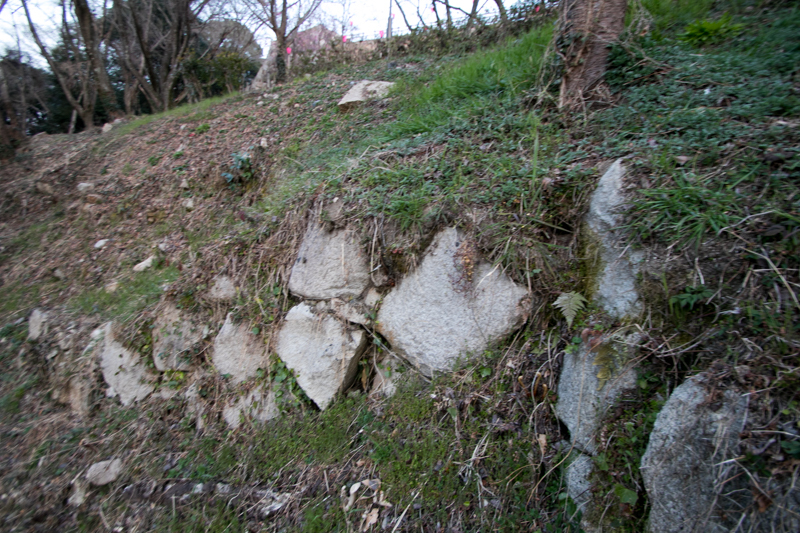 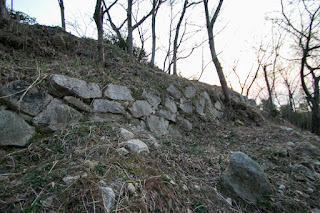 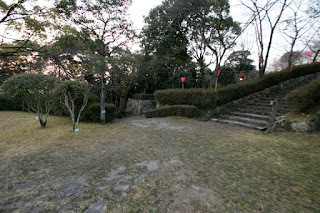 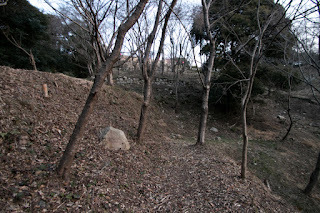 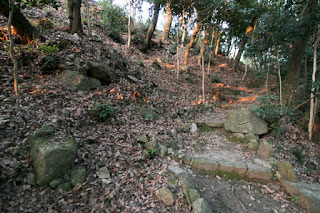 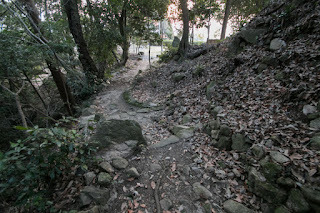 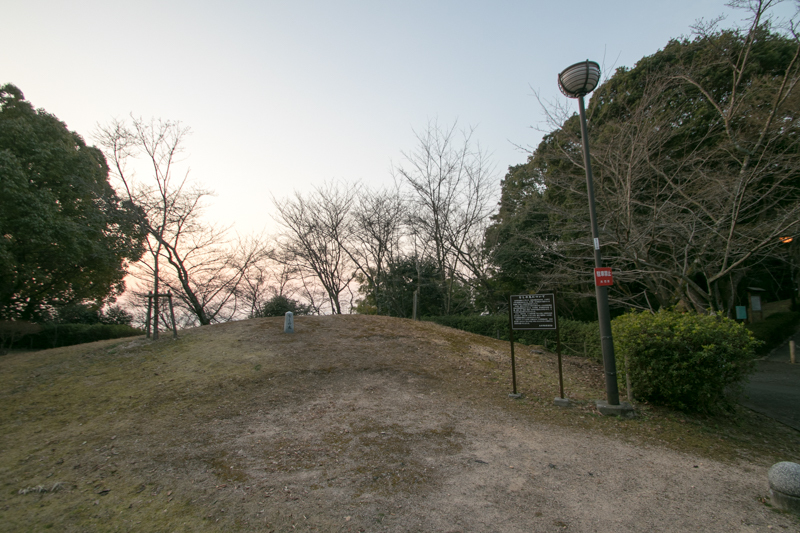 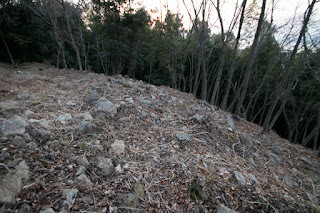 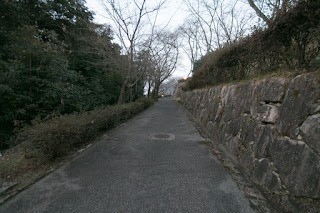 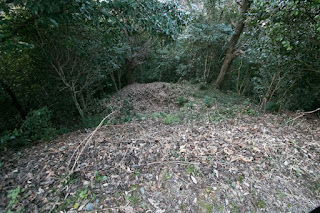 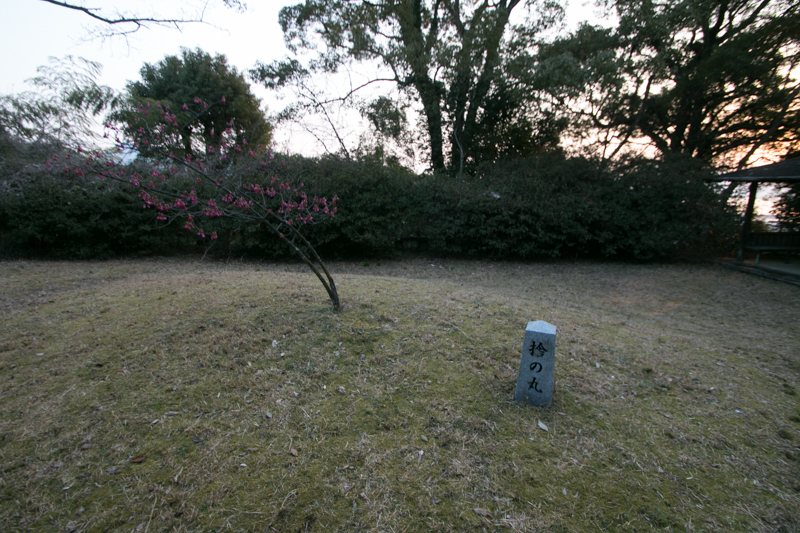 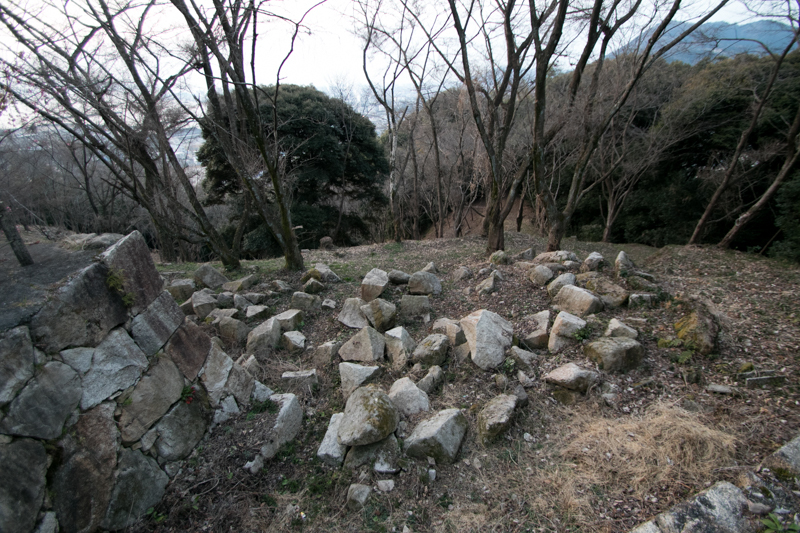 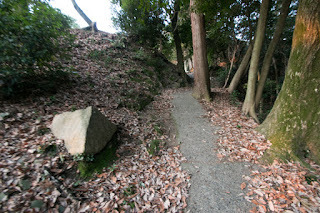 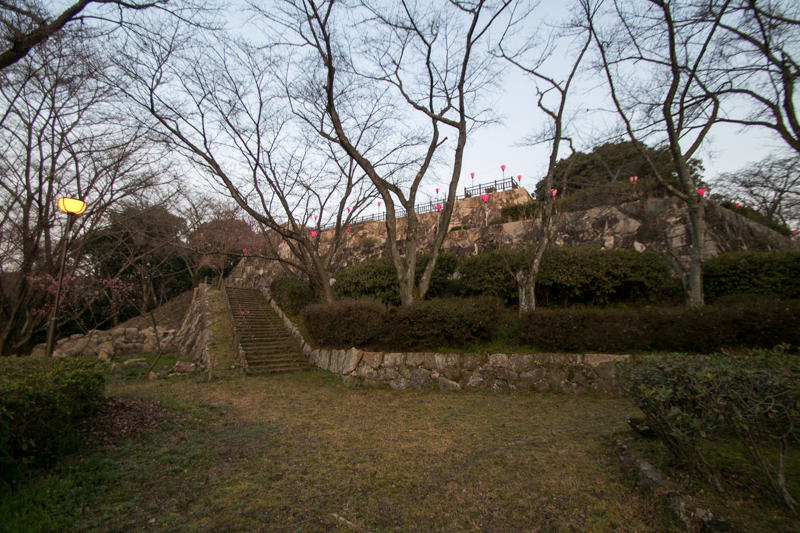 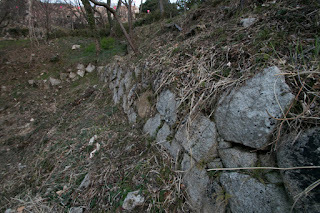 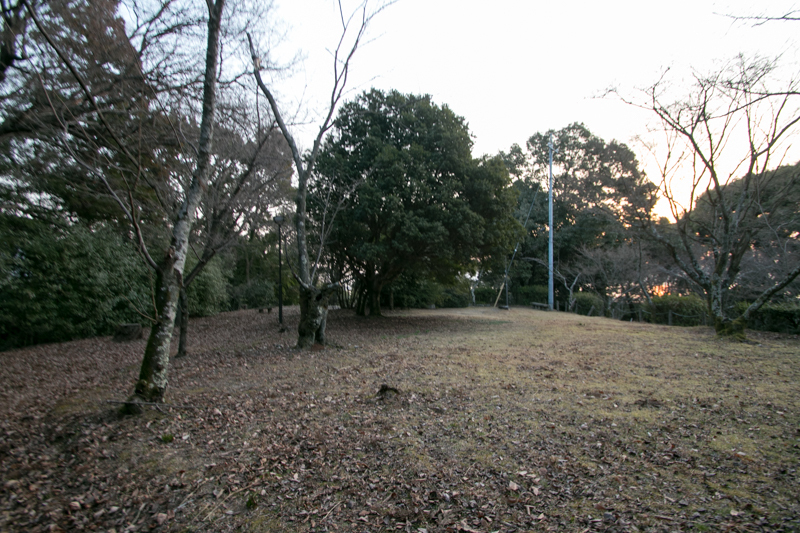 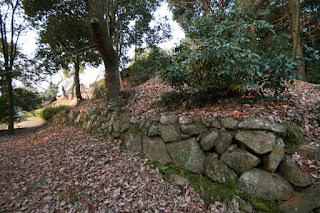 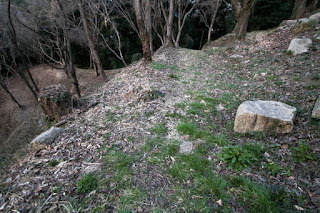 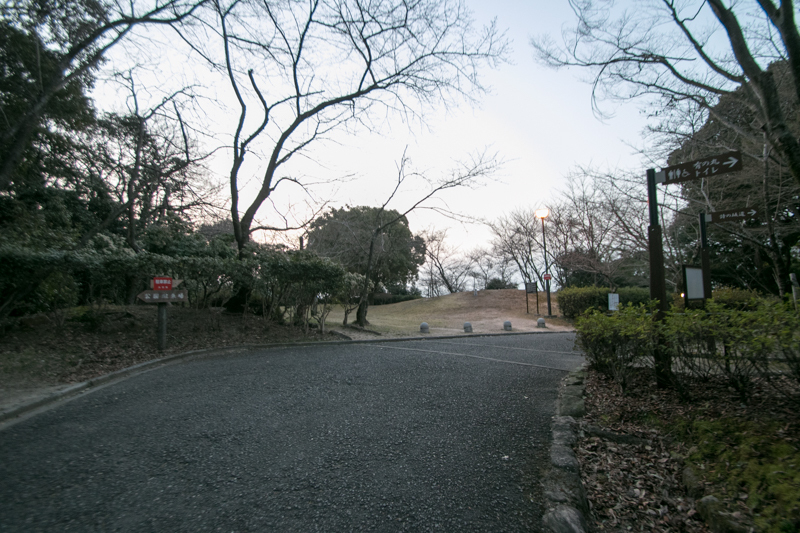 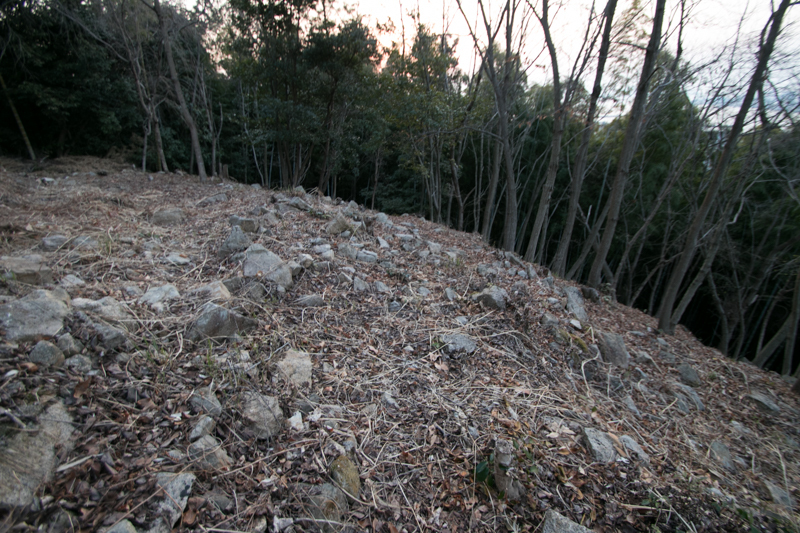 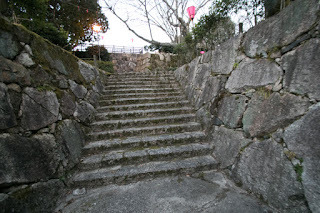 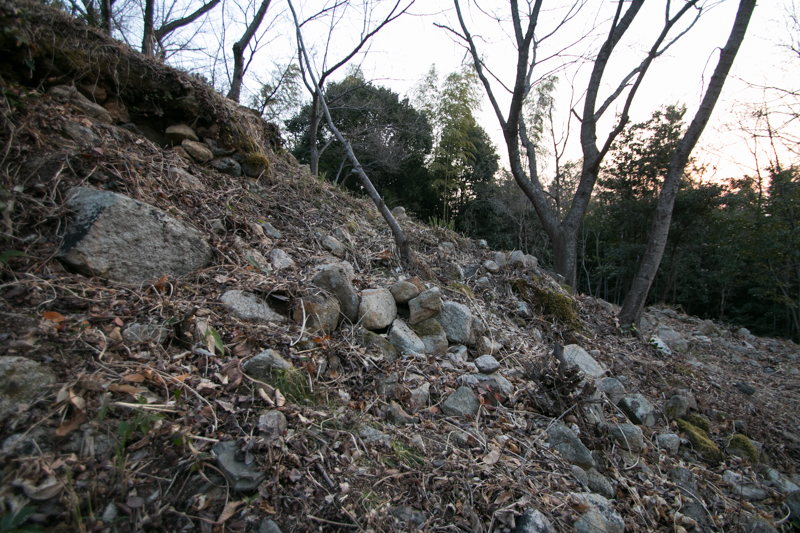 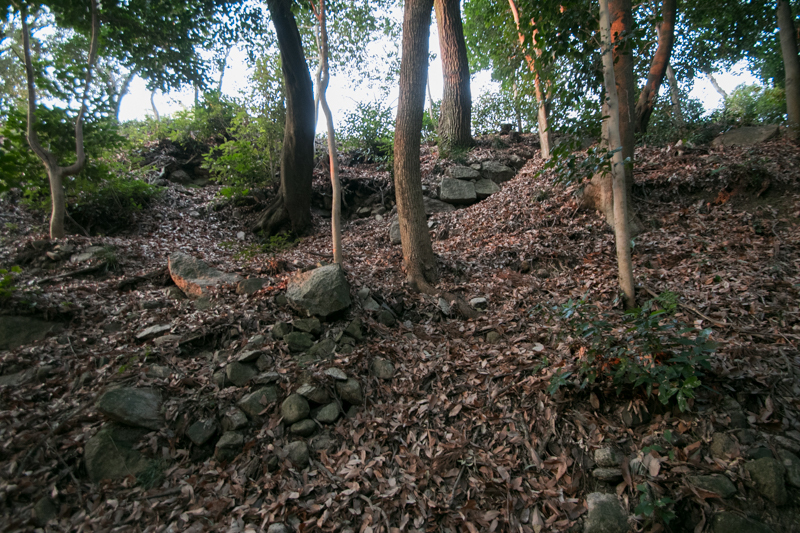 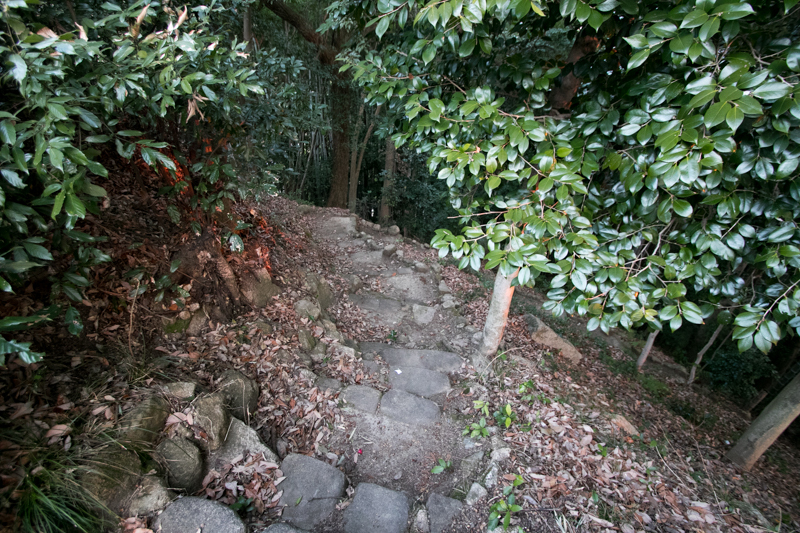 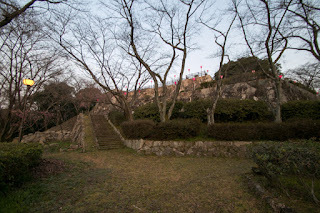 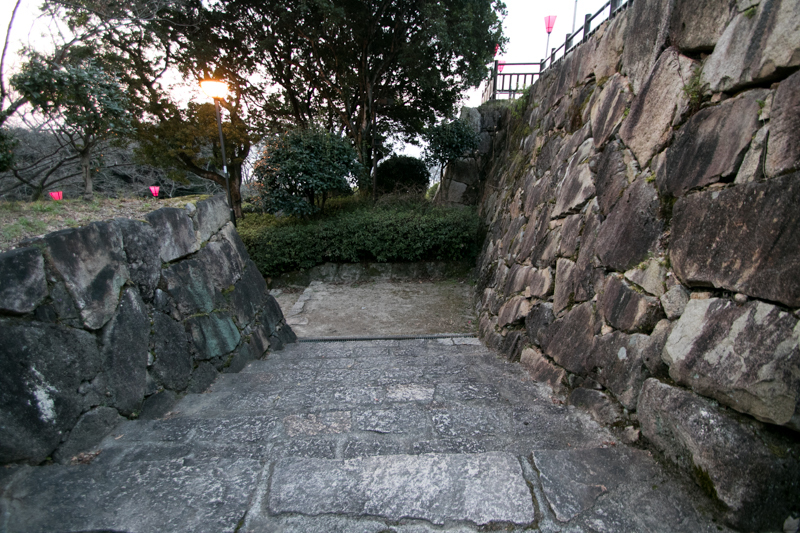 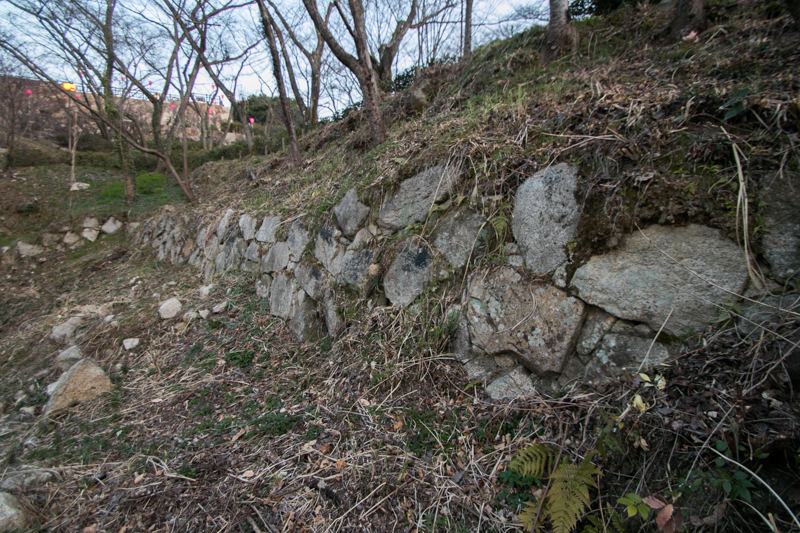 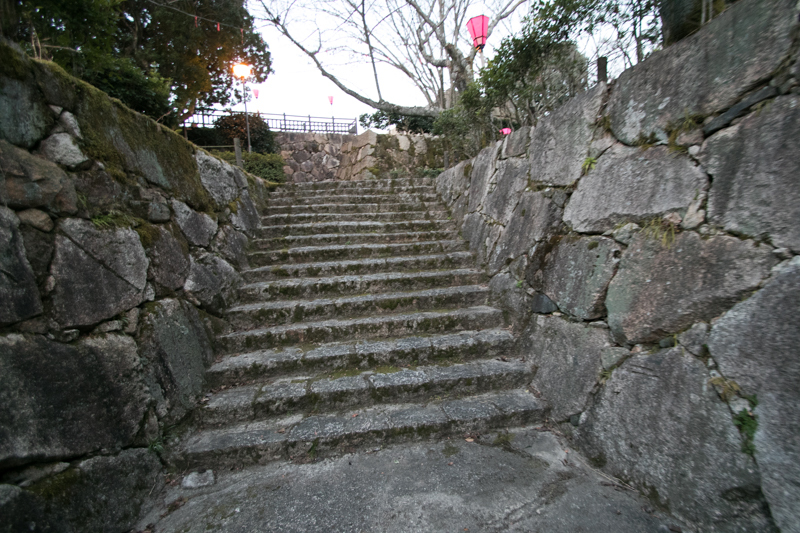 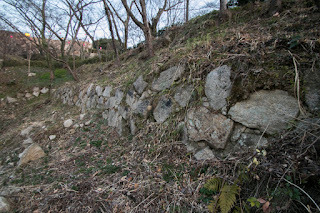 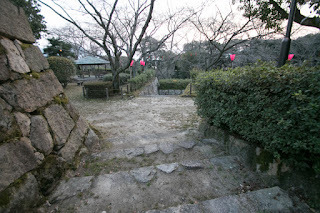 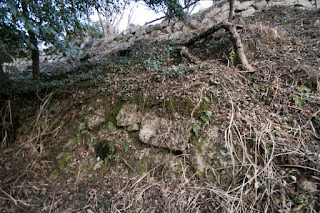 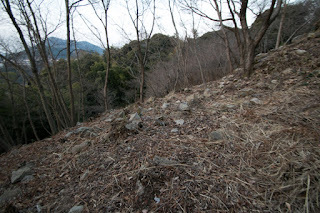 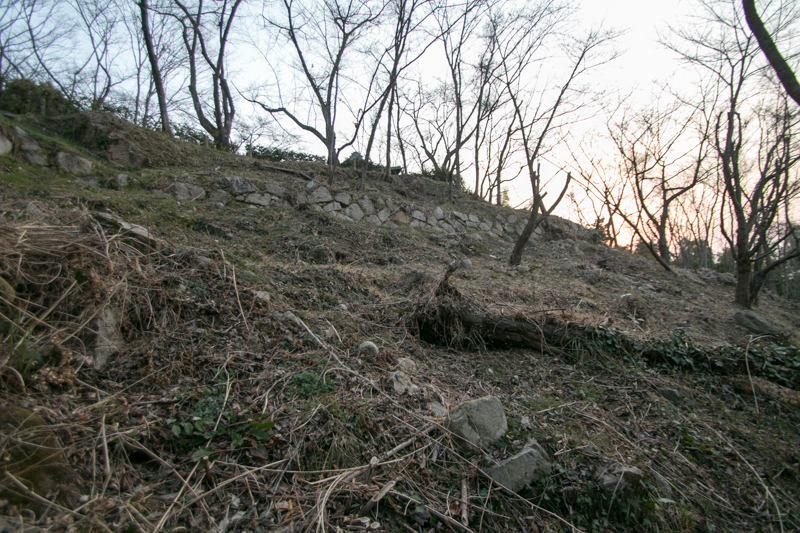 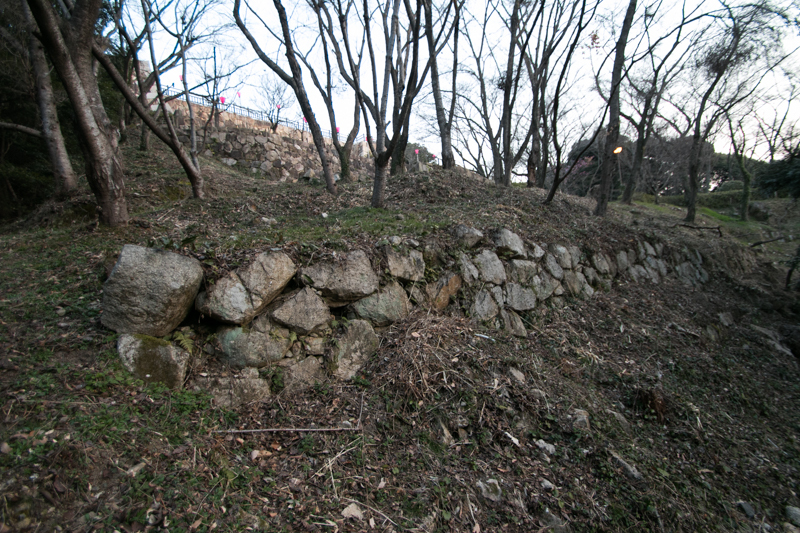 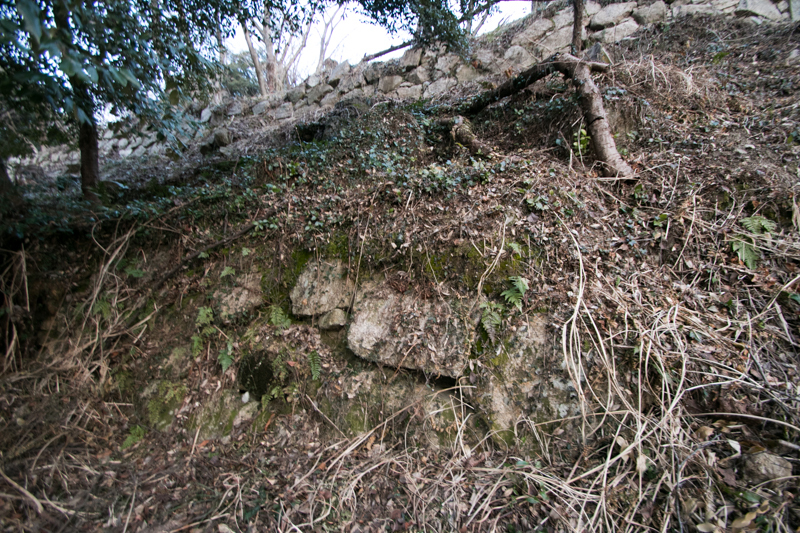 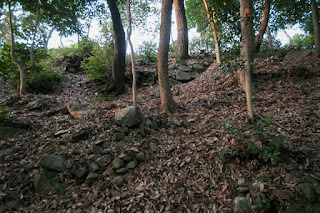 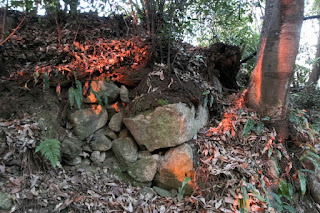 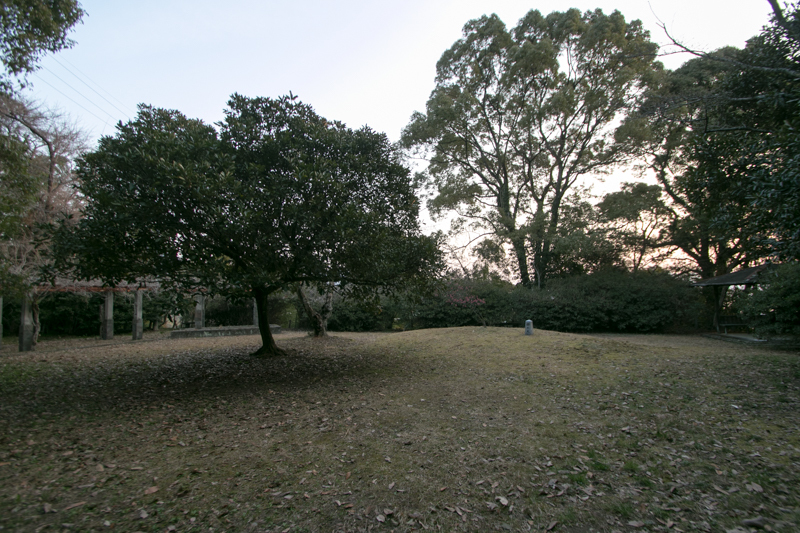 At another small hill in front of Shiroyama hill, Myogenmaru area was built as a front fort of the castle. Enemy which attempts to approach to the castle passing the valley between two hills might face fierce attack from two hills. 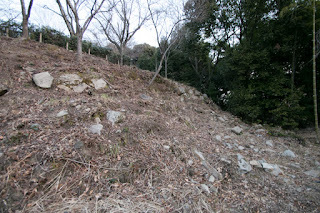 Castle town spreads at the eastern hillside of castle around current Otake city central, and a military port was built at the edge of the town. 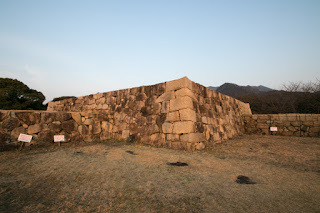 Total size of the castle reached 400 meter long square, and its size and security was equivalent to the main base of middle size feudal lords. Except for the case of utilizing existing main base of former castle, Kamei castle was the largest and strongest branch castle of the lord which was genuinely built as a local base. But at the completion of Kamei castle, Edo Shogunate became to beware of Fukushima clan. Ieyasu captured hegemony after the battle of Sekigahara, but Hideyori Toyotomi still lived at Osaka castle. Ieyasu planned to ruin Hideyori in the future, and Masanori who was a relative of Toyotomi clan and had the large territory was not acceptable. In 1611, Ieyasu ordered Masanori to break Kamei castle, and Kamei castle was demolished just after three years from completion. Around this time Kiyomasa and Masanori tried to reconcile Ieyasu and Hideyori, but Kiyomasa died in ill in 1611 and there was no supporter for Hideyori and Toyotomi clan. 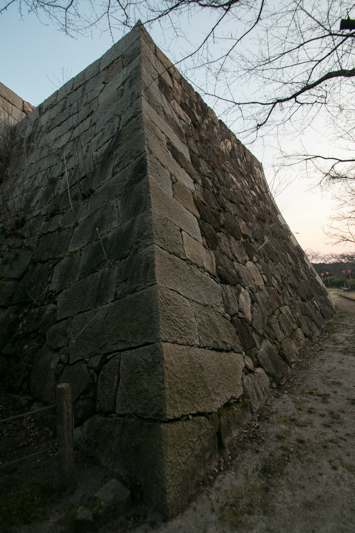 Finally Ieyasu attacked Hideyori at Osaka castle at the battle of Osaka castle in 1614 and 1615, and ruined Toyotomi clan. At this time Masanori was kept at Edo castle as a virtual hostage, but showed a incomplete stance then some retainers supported Hideyori. 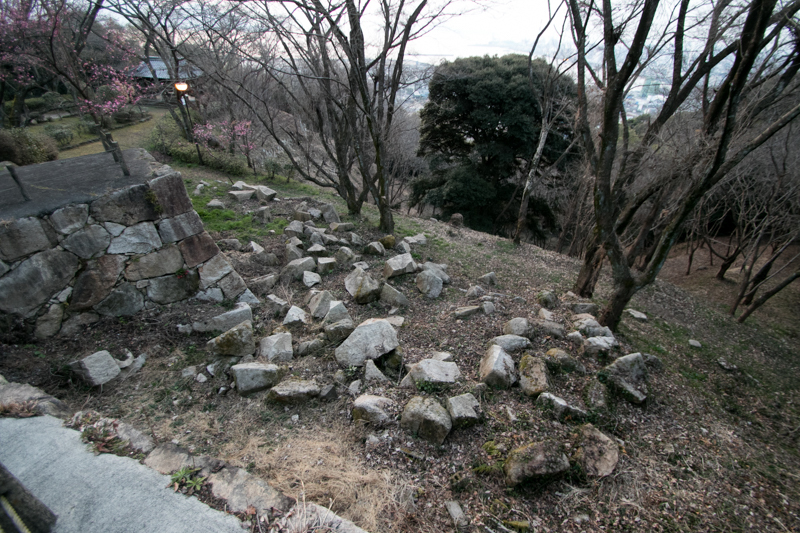 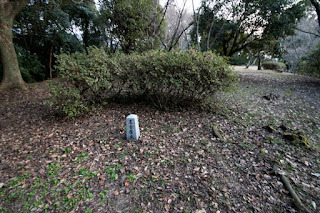 Finally Masanori was punished by made up suspect of repair of Hiroshima castle without permission, and lost his territory. 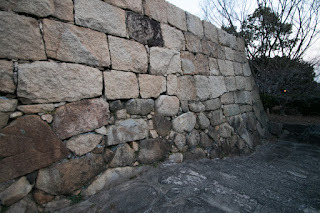 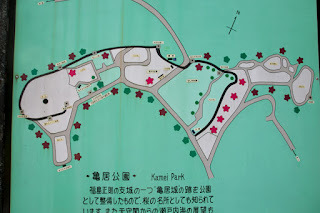 From military perspective Kamei castle might be necessary, but politically it was a castle of excessive defense and attracted unnecessary suspect for Fukushima clan. 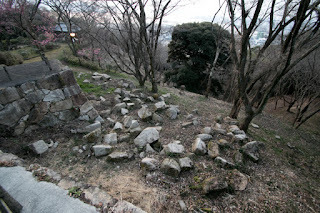 At the time of abolishment, structure of castle was totally demolished and covered by sand. 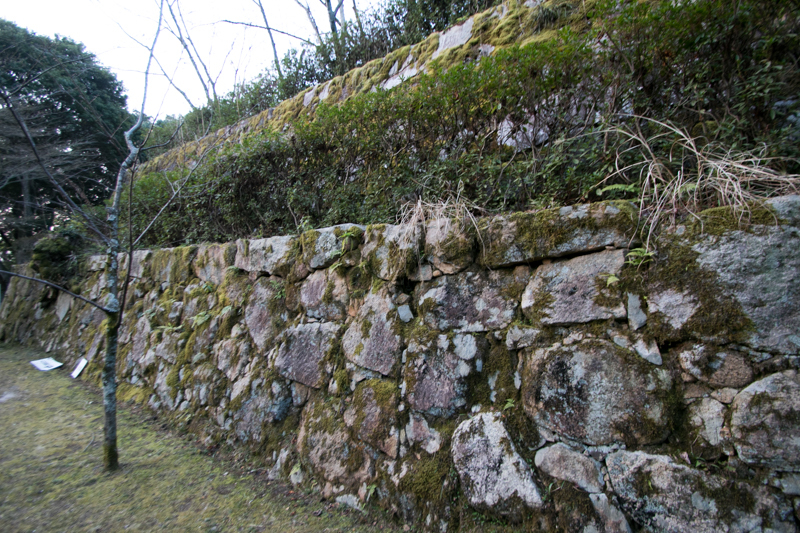 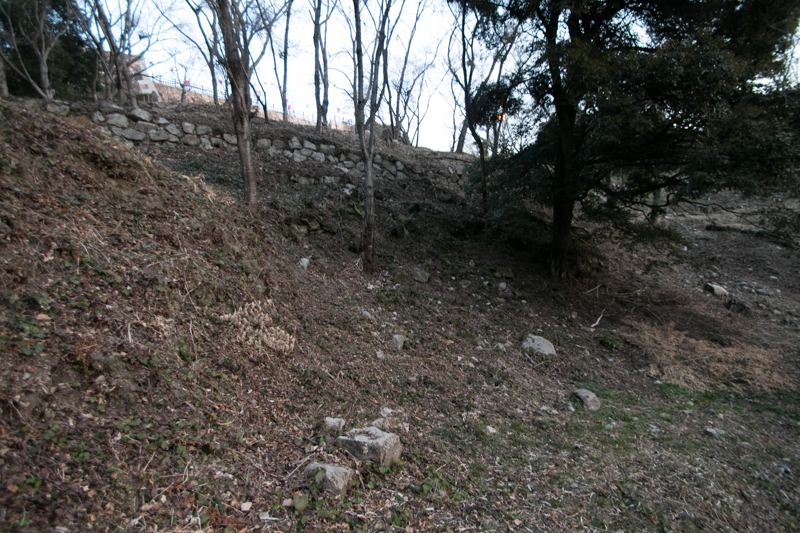 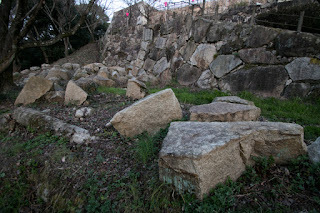 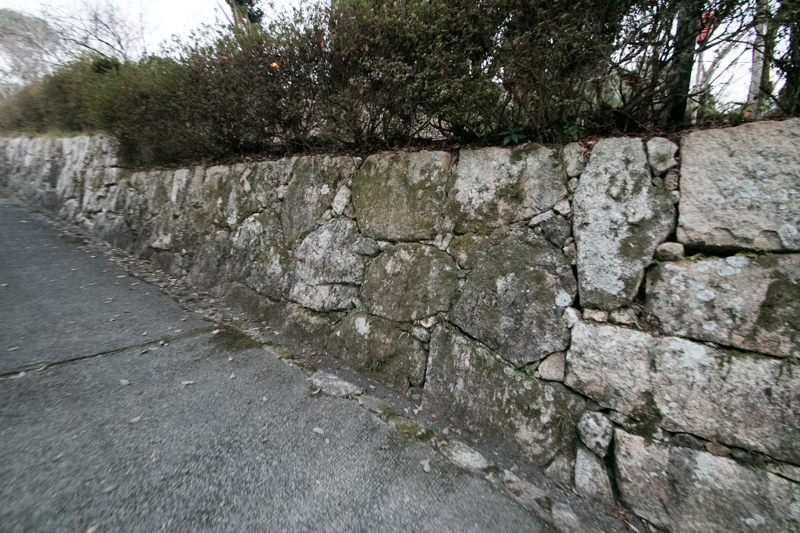 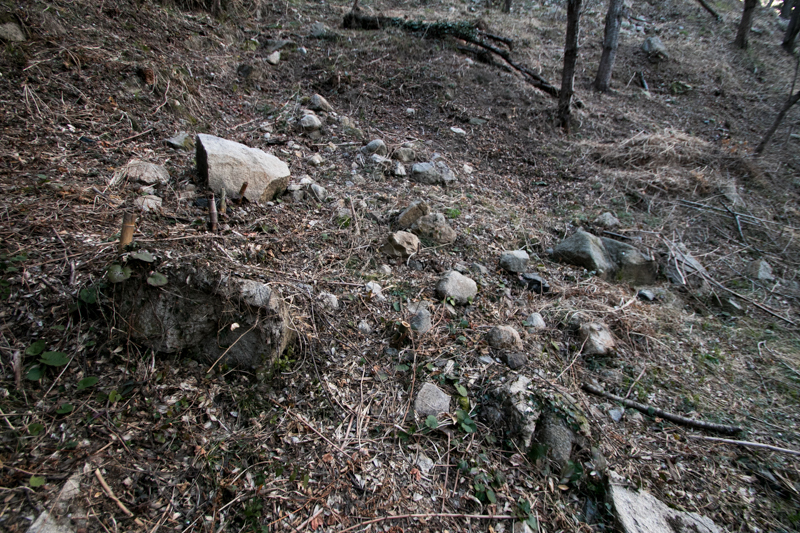 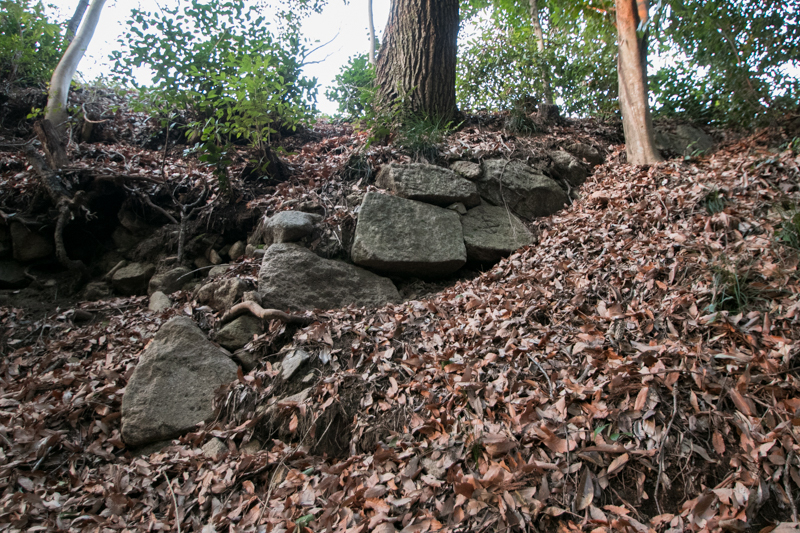 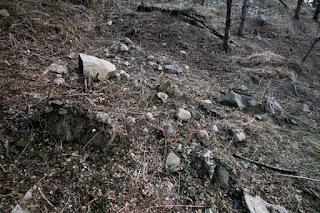 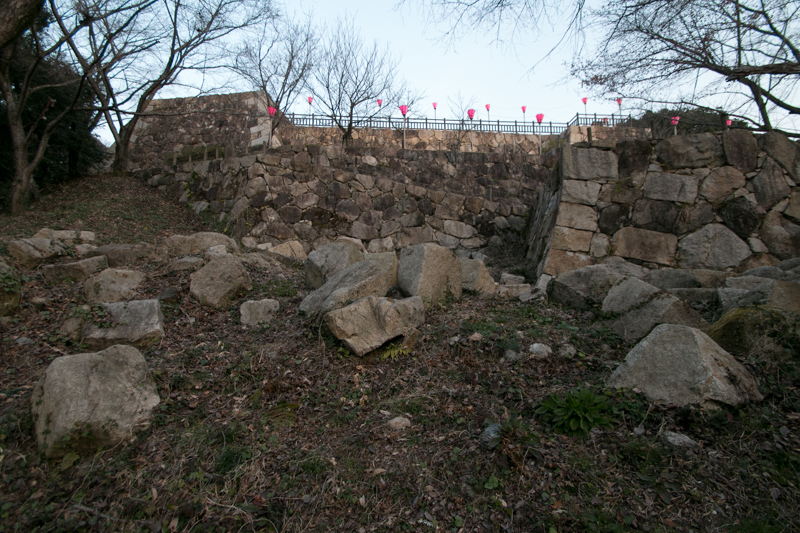 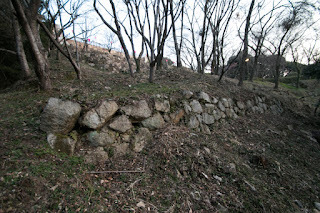 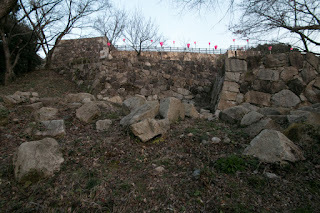 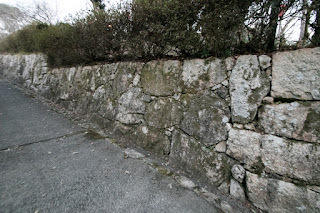 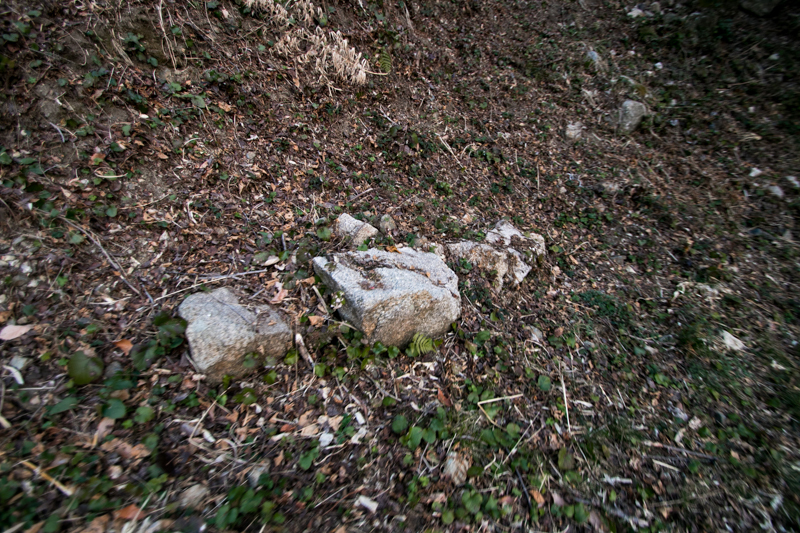 But as a result of investigation, bottom of stone walls was found then stone walls of central area was reconstructed. 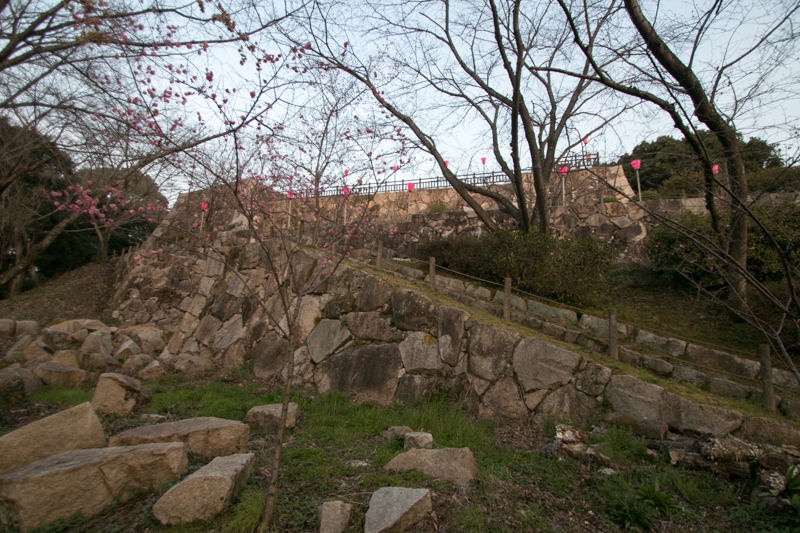 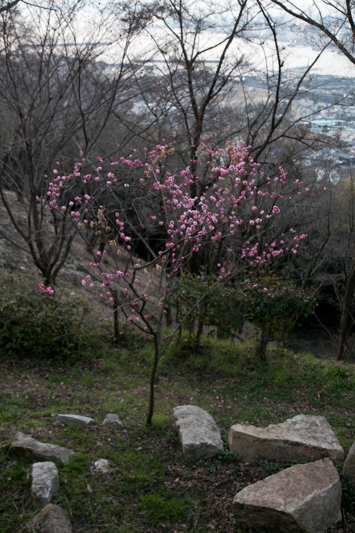 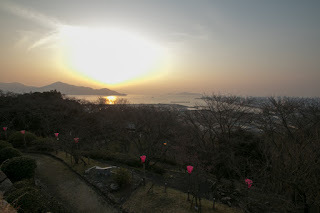 Now castle site became Kamei park, and in spring castle hill is covered by full of cherry blossoms. From central area beautiful scenery of Setonaikai sea and Otake city is seen, which eloquently represents the necessary of this castle. 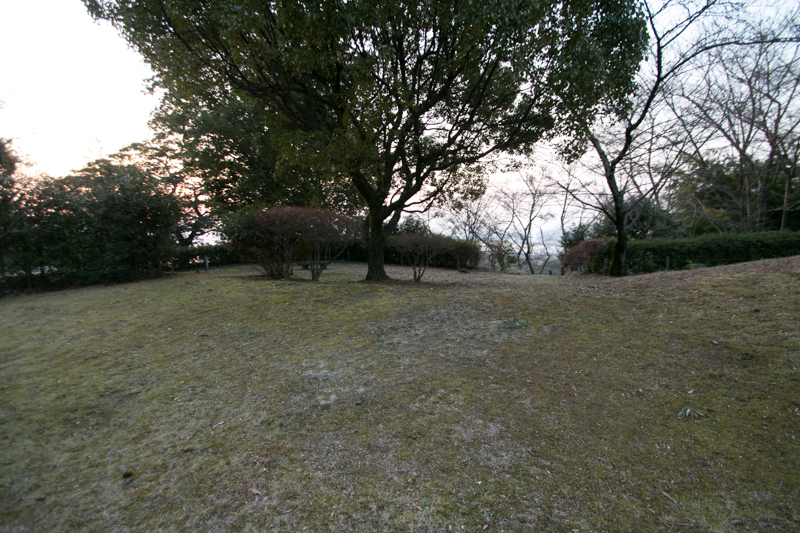 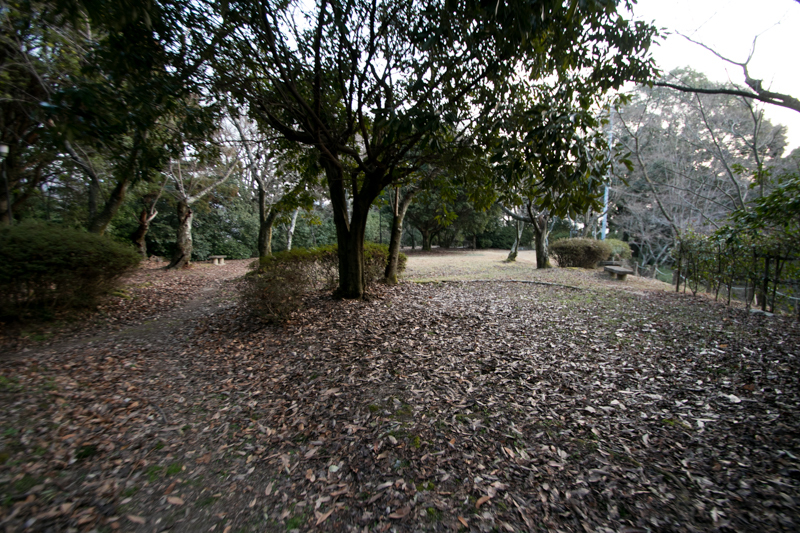 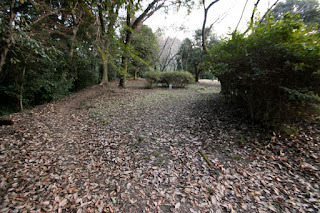 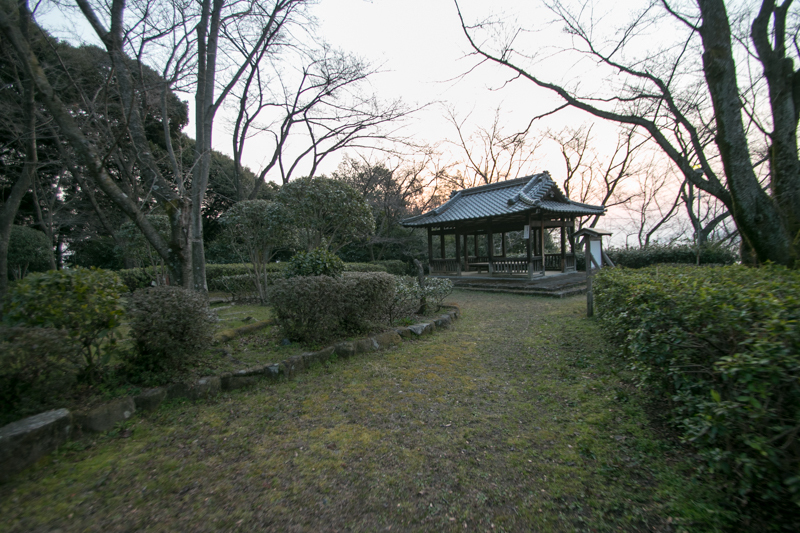 20 minutes walk from JR West Sanyo Honsen line Kuba station. 10 minutes drive from Hiroshima Iwakuni Doro toll road Otake interchange.